Portuguese government bonds are coming under some pressure today as investors react to the unfolding political crisis in Lisbon. While most eurozone bonds have strengthened today, Portugal has gone the other way, pushing up the yield (or interest rate) on its 10-year debt from 2.37% to 2.45%. The move came after opposition parties vowed to bring down Portugal’s new government in a confidence vote later this week. They’re furious that the centre-right coalition, led by former PM Pedro Passos Coelho, has been invited to form another administration despite failing to win a majority in this month’s election. In taking this decision, Portugal’s president Cavaco Silva has enraged some certain commentators who argue that he’s “banned” the Portuguese left-wing a fair crack at power in a massive failure for democracy. It’s a complicated situation, though. No party won an overall majority, although Passos Coelho’s group came first with 38% of the vote. The socialists came second with 32% followed by the hard left Left Bloc with 10% and the communists with 7%. Those three left-wing parties *could* form a majority, but instead president Silva passed the mandate to Passos Coelho. Crucially, and controversially, he also warned that the far-left parties’ anti-EU views were a threat to Portugal. Politics lecturer Chris Hanretty has written a good blogpost here, explaining why talk of a coup in Portugal is a little simplistic. Often, there is no right or obvious answer to the question, “who won the election?”. But if Cavaco Silva’s decision is wrong, then it will be righted automatically by the actions of Parliament in less than a fortnight’s time. If that happens, the alarmists will have been proven wrong. Unfortunately, attention will likely have moved on. Sam Tombs of consultancy firm Pantheon Macroeconomic fears that UK factories will continue to struggle because of the strong pound. He’s created a chart showing how exports fall after the the pound strengthens (the inverted left-hand scale, shifted forwards nine months). The chart shows that the worst is not over for the manufacturing sector; sterling’s further appreciation over the last year will continue to depress export orders until mid-2016, at least. This is a thoroughly disappointing survey through and through which indicates that manufacturers’ struggles are intensifying as a moderation in domestic demand adds to a still weakening export outlook. Persistent and seemingly deepening manufacturing weakness is very worrying for hopes that UK growth can ultimately become more balanced and less dependent on the services sector and consumer spending. More signs that UK manufacturers are having a tough time as they contend with China’s downturn and a stronger pound. The latest survey of factory bosses by business group CBI suggests orders have dropped from both within the UK and outside. The report’s key order book balance is the weakest for more than two years. This does not bode well for official GDP figures due on Tuesday that will give the first snapshot of UK growth in the third quarter. The consensus forecast is for quarterly growth of 0.6% in the July-September period, down from 0.7% in the second quarter, according to a Reuters poll. The CBI’s report suggests that in the three months to October new export orders fell at the fastest pace in three years. That was possibly down to the continued strength of the pound, which makes UK goods more expensive to overseas buyers, the CBI said. Total new domestic orders fell over the quarter for the first time since April 2013. Manufacturing production also edged downwards during the three months to October, marking the first decline in the last two years, according to the CBI Quarterly Industrial Trends Survey. Against that backdrop, manufacturers’ optimism about both their business situation and export prospects for the year ahead fell at the fastest pace since October 2012, according to the poll of 463 companies. But they predicted that overall manufacturing conditions will stabilise in the next three months, with a small rise in output. Rain Newton-Smith, CBI director of economics, says UK manufacturers are being buffeted at home and abroad. 22% of businesses reported an increase in total new order books and 30% a decrease, giving a balance of -8%, the lowest since October 2012. 20% of businesses reported an increase in domestic orders, with 31% noting a decrease. The balance for domestic orders (-11%) was below the long-run average (-5%), the lowest since April 2013 (-14%). 15% reported an increase in export orders, with 33% signalling a decrease. The resulting balance for export orders (-17%) signalled a faster decrease in orders than the historic average (-7%). This marks the lowest rate since October 2012 (-17%). Germany’s central bank reckons that the country’s economy remains “quite strong”, despite signs that growth slowed in the last three months. Bundesbank monthly report (Oct): Despite slower Q3, German economic growth is quite strong. Former hedge fund boss Magnus Peterson has just been banned from the City, over one of the biggest rogue trading scandals of recent years. Peterson’s Weavering Macro Fixed Income Fund collapsed in 2009, costing investors around £350m. It had been marketed as a safe and secure investment, which investors could easily reclaim their funds from. But once the financial crisis struck, Peterson embarked on a series of risky wagers on financial derivatives which failed to reverse its fortunes. He was convicted of several counts of fraud, after the high court heard how he had taken out $600m of swap contracts, which turned out to be worthless, with another company under his control. Mark Steward, director of enforcement and market oversight at the FCA, says Peterson has been banned to protect consumer and markets. This makes little practical difference to Peterson, aged 51, right now, as he was jailed for 13 years in January. Back in the City, UK telecoms group TalkTalk is the biggest faller on the stock market after suffering a major cybercrime attack last week. TalkTalk shares have slumped by around 9.5% this morning. Last week, the firm admitted that customers’ personal and financial details could have been stolen by cybercriminals who breached its security systems. TalkTalk boss Dido Harding told my colleague Josh Halliday last night that it’s too early to say if the company will compensate those affected. “Nobody is perfect. God knows, we’ve just demonstrated that our website security wasn’t perfect – I’m not going to pretend it is – but we take it incredibly seriously. IFO economist Klaus Wohlrabe has confirmed that Germany’s auto industry is shrugging off the revelations that VW deliberately cheated on emissions tests. Speaking to Reuters about today’s IFO report, Wohlrabe pointed out that business expectations and the assessment of current conditions in the sector had both improved this month. That helped to push IFO’s measure of business confidence higher this month, from 103.3 to 103.8. 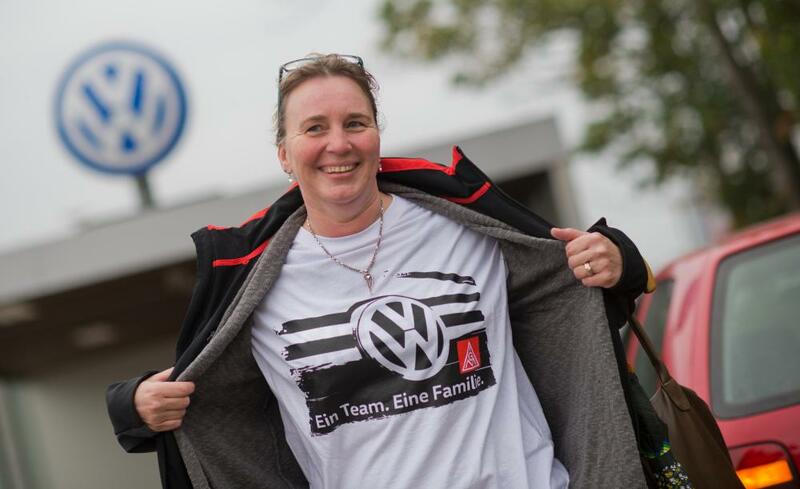 The German automobile industry appears to be unfazed by the VW scandal. German business leaders aren’t frightened by the crisis at Volkswagen, and the slowdown in emerging markets, explains Carsten Brzeski of ING. Surprised but not frightened? German businesses showed an interesting reaction to the recent series of uncertainties and turmoil. In fact, the reaction can be summarized as impressed but not frightened. Germany’s most prominent leading indicator, the just released Ifo index dropped to 108.2 in October, from 108.5 in September. The first drop since June this year. Interestingly, the drop was exclusively driven by a weaker assessment of the current situation. The expectation component, on the other side, increased to 103.8, from 103.3, continuing its recent positive trend and actually reaching the highest level since June last year. Of course, one should not interpret too much in a single confidence indicator but today’s Ifo reading suggests that the German business community is filing the Volkswagen scandal as a one-off and also shrugs off the risk from a possible Chinese and emerging markets slowdown. Despite these external uncertainties and regular concerns about the real strength of the German economy, German business remain highly optimistic. There are two possible explanations for this trend: either German businesses are naive optimists or ice-cold realists, sticking to the facts. In our view, there are many arguments in favour of the latter. Today’s German business confidence survey shows Europe’s powerhouse economy remains in decent health, say City experts. German IFO expectations – one of the most reliable forward-looking indicators – rose for the 2nd consecutive month in October. Business conditions in Germany have fallen this month, according to the latest survey of corporate confidence in Europe’s latest economy. The IFO thinktank has just reported that current conditions in the German economy have deteriorated this month, for the first time in four months. But IFO also found that business leaders are more upbeat about future prospects than in September. That suggests the VW emissions scandal has not caused major trauma. 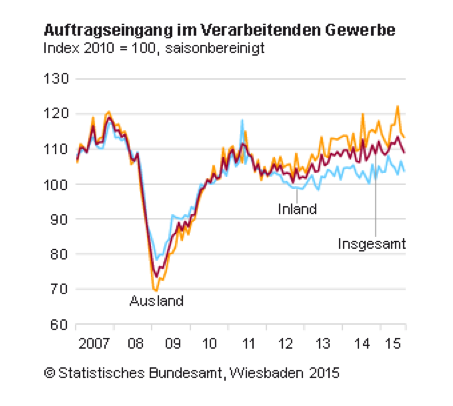 IFO’s business climate index fell to 108.2 in October, down from 108.5 in September, but rather higher than expected. The current conditions index fell to 112.6, from 114 a month ago. That suggests that business leaders are finding life a bit harder — after seeing exports and factory orders deteriorate over the summer. But the expectations index rose to 103.8, from 103.3, indicating that Germany PLC expects to ride out the slowdown in China and other emerging markets, and the Volkswagen saga. #Germany surprises on the upside: Oct Ifo business climate drops less than exp to 108.2 from 108.5; Forecast 107.8, shrugged off VW scandal. Speaking of carmakers…Japan’s Toyota has overtaken Germany’s Volkswagen to become the world’s largest carmaker. Toyota has reported that it sold almost 7.5 million cars in the third quarter of 2015, while VW sold 7.43m. Does that show that the diesel emissions scandal has hurt VW? Not really — that news only broke in mid-September, giving little opportunity for it to show up in these figures. But it does show that VW may already have been finding life tougher, even before admitting that around 11 million vehicles were sold with software to trick emissions tests. 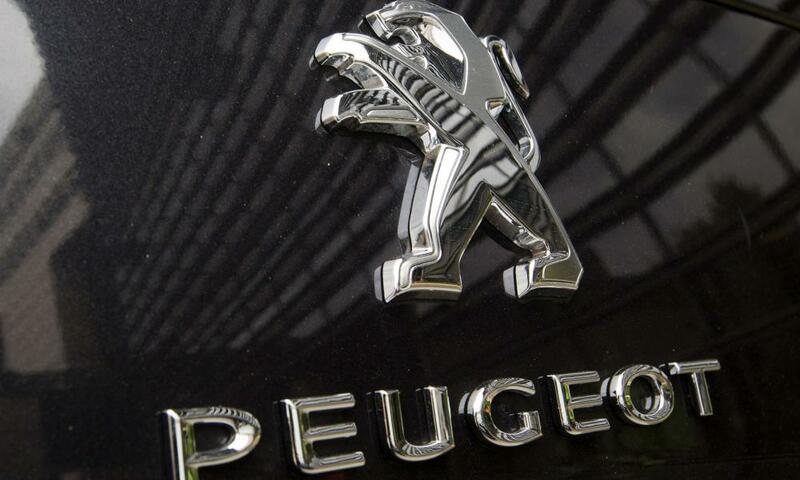 Shares in French carmaker Peugeot are down 2% this morning, after reporting a 4.4% drop in sales in China and South East Asia. That took the shine off a 3.8% rise in sales in Europe. Advertising titan WPP is among the biggest fallers in London, down around 2%, despite reporting a 3.3% rise in net sales in the last six months. Traders may be discouraged by a warning that “risk averse” business leaders are reluctant to stick their necks out too far, given the current geopolitical tensions. Country specific slowdowns in China and Brazil and geopolitical issues remain top of business leaders’ concerns. The continuing crisis in the Ukraine and consequent bilateral sanctions, principally affecting Russia, continued tensions in the Middle East and North Africa and the risk of possible exits from the European Community, driven by further political and economic trouble in Greece, top the agenda. If you are trying to run a legacy business, at one end of the spectrum you have the disrupters like Uber and Airbnb and at the other end you have the cost-focused models like 3G in fast moving consumer goods, and Valeant and Endo in pharmaceuticals, whilst in the middle, hovering above you, you have the activists led by such as Nelson Peltz, Bill Ackman and Dan Loeb, emphasising short-term performance. Not surprising then, that corporate leaders tend to be risk averse. As predicted, Europe’s stock markets have fallen into the red this morning. It has been a surprisingly muted overnight session in Asia with markets showing little reaction to Friday’s rate cut news out of China. London’s FTSE-100 is failing to find any inspiration off the back of the news either, with the vast majority of stocks mired in red ink shortly after the open. The other main markets are also down, apart from Germany’s DAX which is flat. Mining and energy stocks are generally lower, showing that concerns over global growth haven’t gone away. By cutting interest rates, China’s central bank risks creating further instability in a global economy that is already hooked on ultra-cheap money and regular hits of stimulus. Problem number one is that by deliberately weakening their exchange rates, countries are stealing growth from each other. Central banks insist that this does not represent a return to the competitive devaluations and protectionism of the 1930s, but it is starting to look awfully like it. But when bond yields are already at historic lows, it is hard to drive them much lower even with large dollops of QE. In Keynes’s immortal words, central banks are pushing on a piece of string…. Copper, a classic measure of the health of the global economy, hasn’t benefitted much from China’s rate cut. It’s only up by 0.2% this morning. China is also in the spotlight today as top communist officials gather to hammer out its 13th five-year plan, setting the country’s economic programme until 2020. Premier Li Keqiang has already indicated that slower growth is on the agenda, by declaring that Beijing will not “defend to the death” its target of 7% growth (which was narrowly missed in the third quarter of 2015). Trade links and green issues will also be discussed, as China’s top brass try to manage the country’s economic rebalancing. With China easing monetary policy last week, and the ECB expected to follow suit in December, it could soon be Japan’s turn to stimulate its economy again…. No jubilation in Hong Kong either, where the Hang Seng index just closed 0.2% lower. Investors in Asia have given China’s interest rate cut a cautious reception overnight, but there’s no sign of euphoria. In Shanghai, the main index of Chinese shares rose by just 0.5%, or 17 points, to 3430. Although Friday’s stimulus move has been welcomed, traders are also worrying about whether China is still going to suffer a hard landing. Japan’s Nikkei gained around 0.7%, but the Australian S&P market dipped a little despite hopes that its mining sector would benefit from Chinese stimulus moves. Today we’ll find out whether business confidence in Germany has been badly hit by the Volkswagen saga, and the slowdown in emerging markets. The latest IFO survey, due at 9am GMT, is expect to show that German firms are gloomier about their prospects. That’s understandable, given the drop in German exports, factory output and orders in August. We’ll also be mopping up the reaction to China’s interest rate cut, announced late last week. That did give shares a boost on Friday afternoon, but European stock markets are tipped to fall back this morning, as concerns over the situation in China reemerge. China’s rate cut came just a day after the European Central Bank hinted that it could boost its stimulus package soon, so investors have lots to ponder. 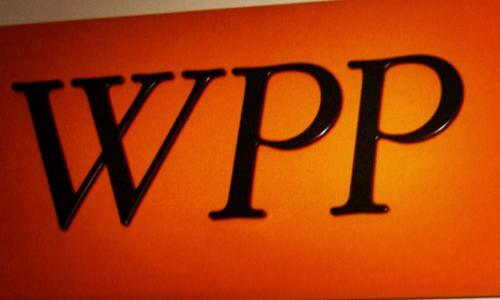 In the corporate world, traders are digesting results from advertising giant WPP and French carmaker Peugeot. And we’ll also be keeping an eye on Portugal, where the president has dramatically asked centre-right leader Pedro Passos Coelho to form another government, rather than two eurosceptic left-wing parties. We’ll be tracking all the main events through the day….. Meanwhile Weight Watchers shares have jumped around 40% in pre-market trading following the news that Oprah Winfrey will invest and join the board. That’s a nice return already on her investment. More news from the US, and Wall Street bank Morgan Stanley has just reported a 42.4% fall in third quarter earnings to $939m. It was hit by turbulence in bond, currency and commodity markets following the concerns about the Chinese economy. 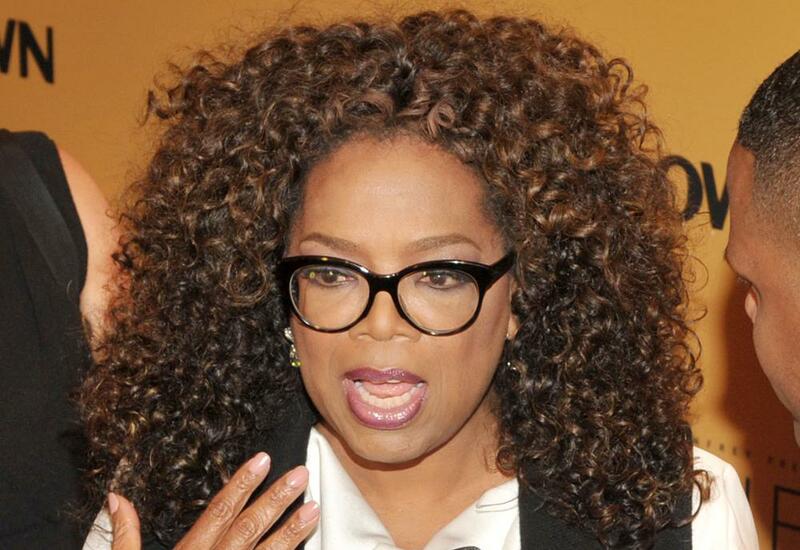 Over in the US, Oprah Winfrey has linked up with Weight Watchers International, buying a 10% stake in the business – with an option for another 5% – and is joining the board. As Chinese president Xi Jinping begins his state visit to the UK, British people expect China to overtake Europe as our most valuable trading partner in 20 years. 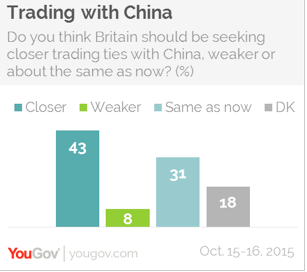 A poll by YouGov also shows Brits are enthusiastic about closer economic co-operation with the Chinese. Of those surveyed, 40% said our most valuable trading partner was Europe, with 23% choosing China. But in the next two decades this is expected to change, with 29% predicting China will be our top partner and 22% forecasting it will still be Europe. Nearly half – 43% – said the UK should be seeking closer trading links with China, with 31% saying it should continue the current level of economic co-operation and only 8% saying it should weaken ties. The majority – 54% – believed China would to continue into the next two decades with either much stronger economic growth than now (22%) or slightly stronger growth than now (32%). Only 14% predicted weaker growth. In addition, 37% expected China’s growth to lift the UK’s, while 26% said it wouldcome at the expense of western economies and 10% said it would not make any difference. The British public seems to have a pragmatic approach to economic relations with China, but there is not much evidence of great affection for the country. Of the 12 biggest economies by GDP excluding the USA and those in Europe, China comes in at 8th in terms of net positive impressions (29% positive, 55% negative). 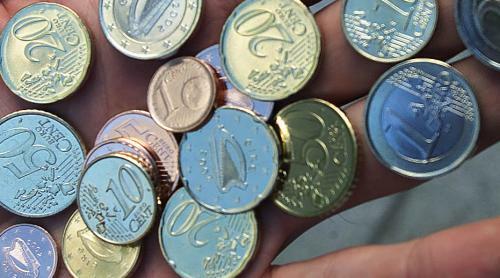 Since the euro was introduced in 2001 Ireland has spent €37m issuing one and two cent coins – minting the coppers at three times the rate of the rest of the eurozone. But the initiative to reduce the need for coppers is voluntary and consumers will retain the right to pay the exact bill and request their exact change. The Central Bank insisted rounding would only apply to cash transactions and not to credit card, electronic or cheque payments and it would also only be used on the final cash total of a bill and not to individual goods. As examples it said final bills ending in one and two cents or six and seven cents would be rounded down to the nearest five and those ending in three and four cents or eight and nine cents would be rounded up. Other rules on the rounding scheme include that one and two cent coins remain legal tender. The nationwide initiative starts on October 28. It follows a successful trial in Wexford in 2013, which showed that 85% of consumers and 100% of retailers in Wexford who expressed an opinion wanted rounding rolled out nationally. If there is one thing to take away from the third quarter figures it is the limited short-term impact of financial and economic stimulus packages on the Chinese economy. The Chinese Government has introduced a number of measures to stimulate economic growth, but so far the needle hasn’t moved much. Right now it’s very important the Chinese Government is focused on the long-term economic fundamentals and resists the temptation to take unnecessary actions simply to meet short-term economic growth targets. One cannot, and should not, read too much into the third quarter growth figures. A growth of 6.9% is slightly below official government expectations but they are also marginally better than the 6.8% that most economists have predicted. Because it’s the weakest growth since 2009, the figures are very symbolic but I don’t think they tell us something substantially new about the state of the Chinese economy. 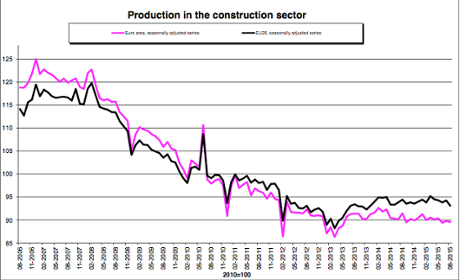 The 0.2% fall in eurozone construction in August compared to July was due to civil enginering declining by 0.3% and building construction by 0.2%, according to statistics office Eurostat. In the wider European Union, construction output fell by 1.2% month on month. The year on year decline in the euro area was 6% and in the EU as a whole 5%. Chinese headline GDP growth looks healthy at 6.9% but underlying metrics suggest the real growth rate could be nearer 3% – 4%. 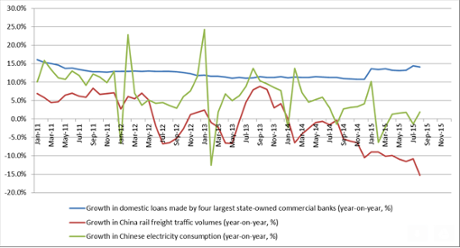 If you look at growth in rail cargo traffic, electricity consumption and demand for loans, three metrics favoured by Prime Minister Li, the picture is not so healthy. Credit growth still looks promising but freight shipments and electricity demand growth look to be sagging, so the so-called Li Keqiang index does raise a few questions. Today’s GDP figures are encouraging but investors with exposure to China should still expect some bumps and lumps along the way. One of the disadvantages of being a stock market index laden with commodity companies is that the sector often has a disproportionate influence on events. So it is today. With the weak Chinese data mining companies have come under pressure on concerns about slowing demand from the world’s second largest economy. With the likes of Anglo American and Glencore down between 2% and 4%, this means the FTSE 100 has slipped back into negative territory, while other European markets are still moving higher. Overall growth in China in the third quarter was a respectable 6.9%, while strength in consumer spending will allay some fears about a slowdown. However, the figures will do nothing to dispel the idea that this particular growth bonanza has come to an end. Big name mining stocks are in the red again this morning, with the sector at its lowest level in nearly two weeks. It looks increasingly like the bounce of early October was a false dawn, and barring some kind of sustained revival in risk appetite, perhaps via fresh monetary stimulus, the sector is heading lower once again. Nowotny repeats #ECB‘s call for looser fiscal policy. But with #Germany likely to resist, onus will remain on more #QE to sustain recovery. One of the main economic events this week is the latest meeting of the European Cental Bank, due to take place in Malta. Despite the weakness of the global economy and continued low inflation, the bank is widely expected to keep its quantitive easing programme unchanged but suggest it is ready to act further if necessary. Many economists believe an expansion of the programme – which involves €60bn of asset purchases a month and is due to run until at least September 2016 – could be unveiled in December. In my view it’s too early to talk about (adjusting the asset purchases) because we still have almost a year of the programme ahead of us. [Nowotny] remarked that Fed policy was not a “decisive aspect” in ECB decision-making, and that one should also not overestimate the impact of a slowdown in China. His more hawkish tone contrasts with the dovish tenor to his remarks from last week, where he acknowledged the clear weakness in domestic inflationary trends. Nowotny said in a separate interview that the ECB has to show it is in control of inflation but governments may need to loosen fiscal policies to boost growth. He said it was too early to determine long term inflation trends, with low oil and commodity prices at the moment having a strong influence. One of the shares pushing the German market higher is Deutsche Bank. It has jumped more than 3% after unveiling plans over the weekend to split its investment bank in two, and removing a number of top executives as part of an overhaul by chief executive John Cryan. Earlier this month the bank announced a record loss of €6bn in the third quarter. European markets are now making a better fist of it after an uncertain start, as traders take a more positive view of the Chinese data (it was disappointing but not as bad as expected). The FTSE 100 is up 0.2%, Germany’s Dax has added 0.9% and France’s Cac is up 0.8%. Over in Greece, and the country’s creditors will be reviewing its finances and the progress of reforms to release the next tranche of the €2bn rescue package. The move follows the successful passing of measures through parliament early on Saturday, despite protests against the package. Representatives of Greece’s lenders – the European Commission, the European Central Bank, the European Stability Mechanism and the International Monetary Fund – are expected to return to Athens on Tuesday to start a review that, Greece hopes, will end successfully, paving the way for the launch of talks on debt relief. 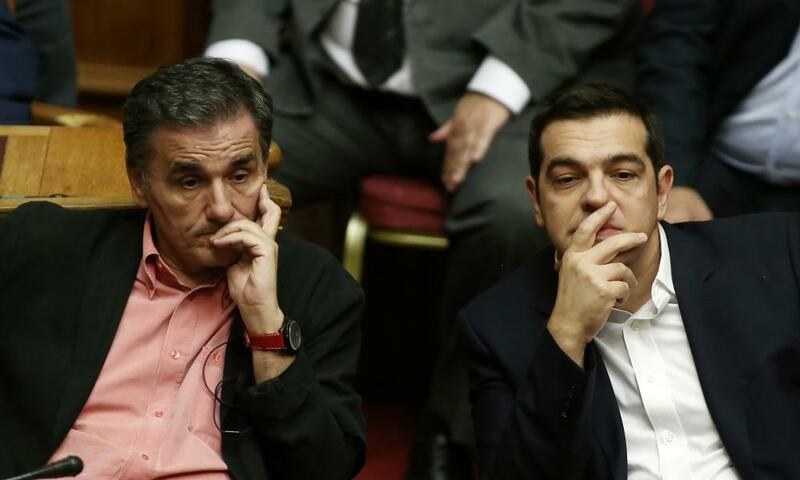 The auditors are to scour Greece’s finances too, following the presentation of the draft budget. Finance Minister Euclid Tsakalotos is expected to request flexibility, arguing that the recession estimates in the draft budget – 2.3% of gross domestic product this year and 1.3% next year – are overly pessimistic. His aim is to eliminate some of the more contentious austerity measures that Greece has suspended, such as plans for a 23% value added tax on private schools and higher taxes on rental income. As regards pension reform, another controversial issue, the government is keen to convince creditors to allow the inclusion of certain prior actions in a broader overhaul of the pension system, to come later. As regards the €2bn loan tranche, the Euro Working Group is to convene on Wednesday and may recommend the immediate release of the money or may ask Greece to legislate more actions from the first list of prior actions. The third quarter GDP data on its own implies a revision in our full-year forecast to 6.9% from 6.8%. However, our previous forecast was based on an acceleration in fourth quarter growth from reduced financial market turbulence and the impact of the stimulus implemented in response to the turbulence. We think the argument still applies and we are revising our full-year forecast to 7.0% (Bloomberg consensus 6.8%). We see the September economic data, including the money and credit data released last week, as enabling the PBOC to remain on hold. We are revising our forecast of one 25 basis point policy interest cut in the current quarter to no more cuts. We retain our forecast of one more cut in the reserve ratio requirement [the amount of cash that lenders must hold as reserves] in the current quarter to sterilize the impact of hot money outflows on interbank liquidity. One of the biggest UK fallers so far is pharmaceutical group Shire. We are committed to working with FDA to expeditiously provide the evidence required to deliver a new prescription treatment option for the 29 million adults in the US living with the symptoms of this chronic and progressive disease. This is an area of unmet medical need for which there has been no new FDA-approved treatment in over a decade. The weak Chinese GDP data has seen European shares get off to an uncertain start for the week. The FTSE 100 is up 0.15% but Germany’s Dax, France’s Cac and Spain’s Ibex have dipped 0.2%. In China itself, the Shanghai composite has ended down 0.1% at 3386.7 points. Oil prices have edged lower on renewed concerns about a lack of demand amid a supply glut, with Brent crude down 0.48% at $50.22 a barrel. On the corporate front, ITV has agreed to pay £100m for the television business of Northern Irish broadcaster UTV in a long expected deal. We see the deal as a strategic plus, especially if ITV can charge retransmission revenues for the main channel where we expect more newsflow before Christmas. We reiterate ITV as our top pick in media sector. The Chinese data comes as the country’s president, Xi Jinping, begins his first official state visit to London. There are likely to be deals signed and co-operation agreements made, but the visit is controversial. It is likely to be marked by protests against human rights abuses, and concerns that the UK may be jeopardising national security by allowing Chinese state companies to invest in British nuclear power plants. In Asia the Shanghai Composite is currently down 0.48%, while the Nikkei is 0.88% lower and the Hang Seng is down 0.54%. Good morning and welcome to our our rolling coverage of the world economy, the financial markets, the eurozone and the business world. China is in the spotlight once more, with news of a slowdown in economic growth in the third quarter. The world’s second largest economy grew by 6.9%, compared to 7% in the previous quarter, and the lowest rate since the 6.2% recorded in 2009 during the global recession. The figure was slightly better than the 6.7% expected by economists but is still likely to prompt concerns about the outlook. The government has cut interest rates five times since November, and further stimulus measures are expected in the wake of a continued slowdown. Last week’s China trade balance numbers showed that while exports improved slightly, the sharp drop in imports suggested that internal demand remains constrained by the weakness in commodity prices, as well as lower domestic consumption, raising concerns that the Chinese government could well find it difficult to hit its 7% GDP target for this year. This morning’s Chinese Q3 GDP was expected to reinforce these concerns, but came in rather conveniently slightly better than markets had been expecting at 6.9%, and above some of the more pessimistic expectations of 6.7%. While most people accept that China’s GDP numbers should only be taking at face value, due to concerns that it is artificially inflated, this number does seem surprisingly good given how weak some of the more recent individual data components have been. This is borne out by a much bigger than expected drop in the September industrial production numbers, which came in at 5.7% and well below expectations of 6%, and well down from 6.1% in August, while Chinese retail sales saw an increase of 10.9%, only slightly higher than August’s 10.8%. Fixed asset investment also disappointed, coming in at 10.3%, down from 10.9% in August. Economist Danny Gabay of Fathom Consulting echoed the scepticism about the Chinese figures. He told the Today programme: “The figures are produced remarkably quickly and rarely revised.” And he believes the real figure is closer to 3%. Otherwise it appears a relatively quiet day so far, but we’ll be keeping an eye on all the latest developments. Forbes conceded that if some of the potential risks to emerging markets play out – such as a sharper than expected slowdown – “then the UK economy is unlikely to be immune”. But she said the UK’s exposure “appears manageable”. US markets have fallen back in early trading, along with other global markets in the wake of poor Chinese trade figures, which cast new doubt over the prospects for the world’s second largest economy. The Dow Jones Industrial Average is down more than 90 points or 0.5%, while European markets are also still firmly in the red. After the Treasury Select Committee heard from the newest member of the Bank of England’s Monetary Policy Committee, Jan Vlieghe, who appeared in no hurry to vote for a rate rise, it was the turn of fellow rate-setter Ian McCafferty. McCafferty appeared less worried about the negative impact on the UK and the inflation outlook from a global economic slowdown. “I place more weight on some of the upside domestic risks to to inflation over the three-year horizon,” McCafferty told MPs. He also expects a tightening labour market will mean nonimal wage growth accelerates further over 2016 and 2017 and that is something that will only be offset to “some extent” by a pick-up in productivity growth. 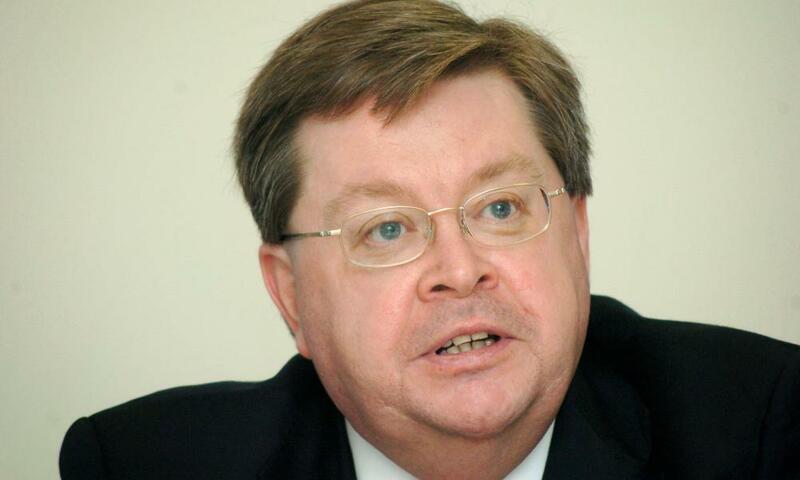 McCafferty described himself as not hugley optimistic about productivity growth improving. The latest official figures showed inflation dipped into negative territory in September, at a rate of -0.1%. But McCaffterty sought to reassure MPs “I do not think we are entering a form of deflation” and noted there were few signs of changes in consumer behaviour as a result of stagnant prices. Asked whether the latest news on inflation might influence him, McCafferty said it would not. Nor would the latest warning about weaker global growth from the International Monetary Fund. “In isolation, those things would not on their own change my view of the last few months,” he said. Unless you’re making a paper aeroplane, your roadmap doesn’t need to be streamlined. Over in California, Twitter has just announced plans to cut around 8% of its workforce. Jack Dorsey hasn’t wasted much time since becoming CEO again. In a letter to staff, he says Twitter will “part ways” with up to 336 workers in an attempt to grow faster. It’s a tough decision, Dorsey says, but necessary as “the world needs a strong Twitter”…. As usual, the sound of job cuts goes down well on Wall Street – Twitter shares have risen in pre-market trading. One of the bankers blamed for the financial crash in Ireland due to over-lending to property speculators faces extradition from the United States later today. 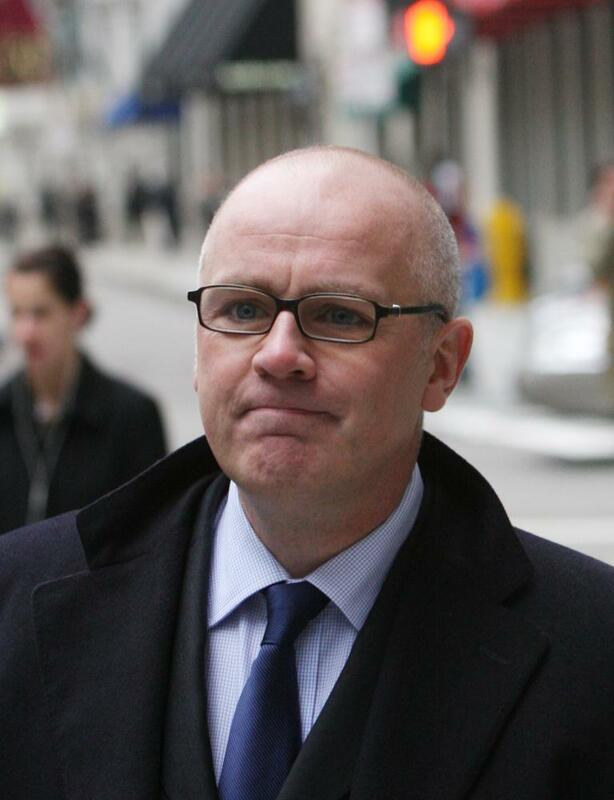 David Drumm, a former senior figure in the now defunct Anglo Irish Bank, will appear in a court in Boston where he has been living in exile since the institution collapsed in 2009 and hundreds of millions of taxpayers money was spent to nationalise it. An American judge will decide today whether his arrest at the weekend in Massachusetts at the weekend was lawful. If the judge rules it was then this will pave the way for Drumm’s extradition back to Ireland where he will face up to 33 criminal charges including seven counts of forgery and seven counts of falsifying documents. Drumm’s re-appearance in the Irish media is a reminder on Ireland’s Budget Day of the bad old days before the crash and the international bail out when bankers loaned billions to property speculators which in turn dangerous overstretched not only key business figures in Ireland but also overheated the Republic’s economy. Our economics editor, Larry Elliott, has taken a look at today’s UK inflation data, which showed prices were 0.1% cheaper in September than a year ago. This is going to be a record-breaking year for UK inflation. Not since the interwar period has upward pressure on the cost of living been as persistently weak as it has since the start of 2015. But this is being driven by cheaper commodities, as emerging markets slow down. The Bank of England is therefore confronted with a situation in which the inflation rate for goods is currently -2.4% while the inflation rate for services is +2.5%. So what happens next? Larry reckons prices will pick up in 2016, pushing inflation back towards the 2% target. Unless the global economy sours…. The top 1% of wealth holders now own half of all household wealth. And that includes 120,000 “ultra-high net worth individuals” across the globe who own at least $50m of wealth each. 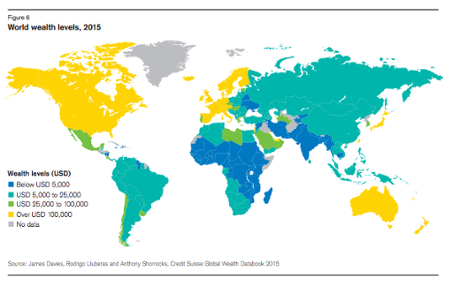 That’s according to Credit Suisse’s latest wealth report, which is packed with details about the distribution of wealth across the globe. 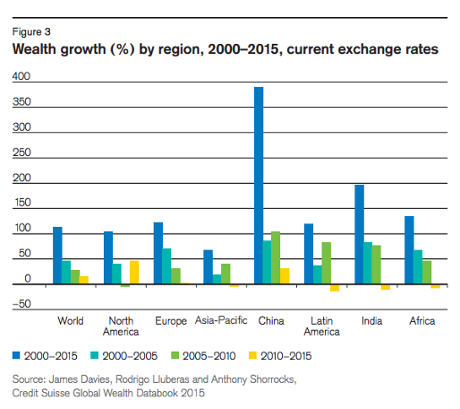 This year’s report shows that China’s stock market boom has helped to create more ultra-rich people there. Chinese multimillionaires and billionaires make up 8% of all UHNWI’s. 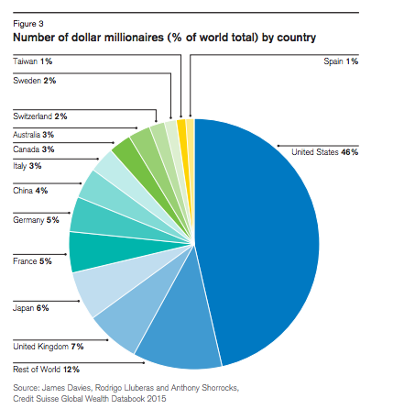 The group of millionaires below the $50m mark make up another 0.7% of global population, but owns 45.2% of global wealth. But while the ultra rich have got even richer, others aren’t keeping pace. Notably, we find that middle-class wealth has grown at a slower pace than wealth at the top end. This has reversed the pre-crisis trend, which saw the share of middle-class wealth remaining fairly stable over time. Here are some charts from the report, which is online here. 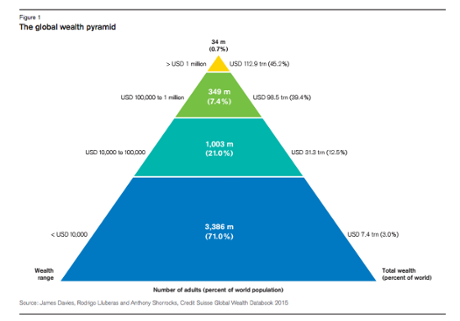 The top slice of this pyramid group is made up of 34 million US dollar millionaires, who comprise less than 1% of the world’s adult population, yet own 45% of all household wealth. Credit Suisse estimates that 123,800 individuals within this group are worth more than $50m, and 44,900 have over $100m. 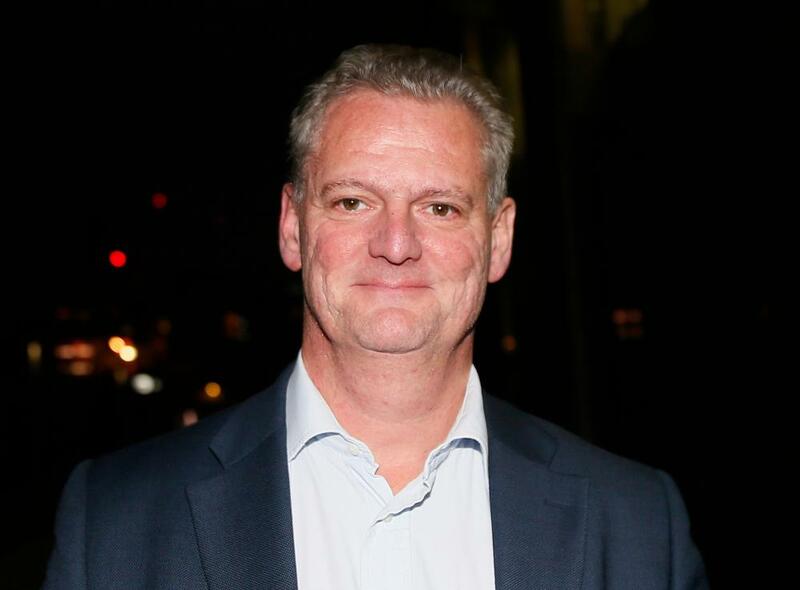 UK parliament’s Treasury Committee has been hearing from the newest member of the Bank of England’s rate-setting Monetary Policy Committee, Jan Vlieghe, and it appears he is in no hury to vote for a hike. This is the first time financial markets are getting a chance to hear what the new MPC member thinks about the UK economy, the global outlook and what should come next for interest rates in the UK. After the Bank’s chief economist, Andy Haldane, recently raised the prospect of a rate cut – from what is already a record low of 0.5% – in the face several risks to the economic outlook, Vlieghe too is not ruling out even lower borrowing costs. He is worried about the Bank meeting its government-set target for inflation at 2% on the consumer prices index (CPI), which fell to -0.1% this morning. Asked if the BoE had run out of tools, Vlieghe said “we can cut rates if we judge it necessary” and that the Bank could also re-start its asset purchase programme, also known as quantitative easing (QE). Vlieghe highlighted what he saw as risks to the UK from China’s downturn and the wider global slowdown. “Clearly, the UK is an open economy, it has very important trade and financial links to the rest of the world. The UK is in reasonably good shape, growth is solid but not fantastic. He set out some upsides and downsides in the current domestic situation. “What we are trying to judge is how these play off against each other,” Vlieghe added. As for when he might vote for rates to go higher, after already more than six years at their record low, the former hedge fund economist highlighted a host of low inflation numbers from the core rate to people’s inflation expectations. Speaking after official figures showed headline inflation turned negative in September, Vlieghe said other prices indicators too were “all a little bit below where you’d want them to be to be confident of meeting the 2% inflation target in the medium term”. Despite the evidence of today’s ZEW survey, German economy minister Sigmar Gabriel has claimed the diesel emissions scandal at Volkswagen won’t permanently damage the German economy. It may be too early to be sure, though. Yesterday, Britain’s transport secretary said Volkswagen deserves to suffer “substantial damage” because of the diesel emissions scandal. For the first time in seven years an Irish budget will actually be giving away something for its citizens after the years of tax hikes, brutal spending cuts, the humiliation of an IMF-EU bail out and the crash of the Celtic Tiger. A cut of to the hated Universal Social Charge tax which was brought in to help plug the gap in public finances during the bail out times. The promise of 20,000 new public homes taken from the portfolio of properties nationalised after the financial crash and the bankruptcies of property speculators. Increases in child benefits and a freeze on prescription charges. Of course it is hardly a coincidence that the Fine Gael-Labour goverment are facing into an election year in 2016 and will no doubt face accusations from opposition parties of trying to bribe their way back into power. In return the coalition will argue that they have done the “heavy lifting” after four years in office, carried out the painful adjustment policies that restored the nation’s finances and oversaw growth in the economy, and managed an exit from the bail out. One thing is for sure – Enda Kenny and his administration are going to wait for at least three months before today’s budget measures sink into the public’s consciousness. The Taoiseach has finally decided that he won’t call the election until late February/early March. The wisdom of that decision to go late rests an awful lot on the impact of today’s Budget 2016. The Volkswagen diesel emissions scandal and economic problems in emerging markets have become a toxic cocktail for confidence within Germany, new data shows. Morale among German investors and analysts fell sharply in October, according to the ZEW think tank, pulling its economic sentiment index down from 12.1 to just 1.9. ZEW’s assessment of the current situation in Germany also fell, by 12.3 points to 55.2 points. Despite that, Fuest reckons Germany will not fall back into recession. For the survey, ZEW asked analysts and institutional investors about their current assessment of the economic situation in Germany, as well as their expectations for the coming months. Over in Germany, Volkswagen has just announced that it is cutting its investment programme by €1bn per year, as it grapples with the fallout from the diesel emissions scandal. In a statement just released, VW announced a range of changes including shifting all its diesel cars to cleaner exhaust emissions systems, and making the next generation of its Phaeton car run on electricity..
“The Volkswagen brand is repositioning itself for the future. Over in parliament, MPs are beginning to quiz former hedge-fund economist Gertjan Vlieghe about his appointment to Britain’s Monetary Policy Committee. You can see it here. It could be quite tasty, as explained earlier…. 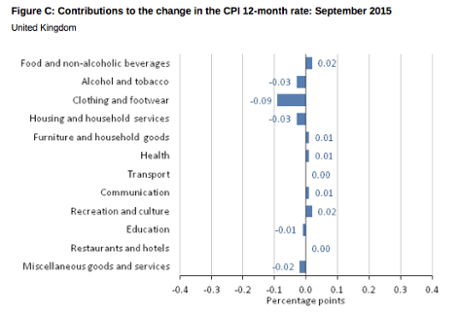 September’s inflation rate is used to calculate a range of benefits payments in the UK. Consumer expert Paul Lewis reports that these payments will now be frozen, as will other payments linked to the headline inflation rate. CPI of -0.1% means benefits will be frozen – not cut -including the extra bits of state pension. Company pensions linked to CPI also frozen. To be clear all the extra bits of the state pension are index linked with CPI. They will be frozen next April because Sept CPI is -0.1%. He reckons inflation will pick up sharply in 2016, once the recent slump in oil prices fades into history. Headline inflation has been pressured for nearly a year now from falling energy and commodity prices but we must remember that base effects will see that initial drop in oil prices fall out of the calculations in the coming months. Howard Archer of IHS Global Insight also sees UK interest rates on hold for longer. With inflation back below zero, it’s hard to see Britain’s interest rates rising from their current record low before 2016. “Inflation is back in negative territory again and it’s very unlikely that we’ll see the Bank of England raise interest rates this side of Christmas. Although wage pressures are emerging and the impact of the falling oil price will soon start to drop out of the numbers, a rate hike would have a deflationary effect by pushing up Sterling. Underlying CPI picture is of inflation close to zero for several months, and a big boost to real wages, which continues. Deflation is a protracted period in which prices fall in a downward spiral, and people stop spending because today’s items are going to be cheaper tomorrow. The bigger picture is of a broadly flat inflation rate since the beginning of the year, says Richard Campbell, head of CPI at the Office for National Statistics. Clothing and footwear prices rose by 2.8% between August and September this year, compared to 4% between the same 2 months a year ago. That pushed the inflation rate down, to 0.1% in September. Fuel prices fell by 2.9% between August and September this year compared with a smaller fall of 0.6% between the same 2 months a year ago. The largest downward contribution came from petrol, with prices falling by 3.7 pence per litre between August and September this year compared with a fall of 0.8 pence per litre between the same 2 months a year ago. Diesel prices are now at their lowest level since December 2009, standing at 110.2 pence per litre. And a price cut by British Gas also helped cut the cost of living. Gas prices fell by 2.1% between August and September this year, compared with no change between the same 2 months a year ago, with price reductions from a major supplier. Food and fuel have played a key role in dragging UK inflation down in the last year. Over the last year, food prices fell by 2.5% and prices of motor fuels fell by 14.9%, according to the ONS. 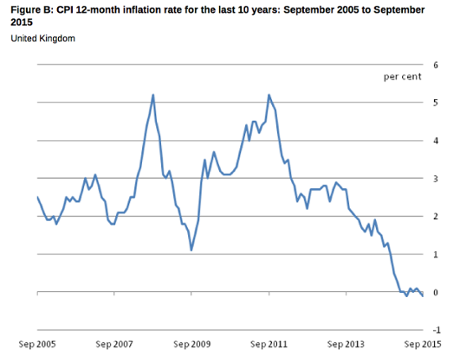 This chart confirms that the UK’s inflation rate has been bobbing around zero for most of this year. Here we go! UK inflation has turned negative again! The Consumer prices index fell by 0.1% in September, the Office for National Statistics reports. That’s weaker than the zero reading that economists had expected. It’s the first sub-zero reading since April. Crumbs! The pound has just taken a dive in the foreign exchange markets, dropping almost one cent against the US dollar. 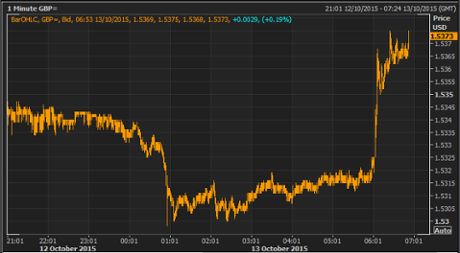 Traders may be calculating that September’s UK inflation reading, due in a moment, is weaker than expected. Could the inflation number possibly have leaked?? More signs of weakness in Germany – Berlin is expected to trim its estimate for growth this year to 1.7%, down from 1.8%. Economy minister Sigmar Gabriel could announce the new forecast tomorrow, according to Reuters. This follows a hattrick of bad economic data last week, with factory orders, industrial production and exports all declining, as emerging market problems hit Germany. Just 30 minute to go until we get the Britain’s inflation date for September. City economists broadly expect that the consumer prices index will remain flat for a second month, leaving inflation at zero. But a negative reading can’t be ruled out. Falling pump prices and a cut in energy bills by British Gas are expected to have kept inflation at zero last month, putting little pressure on the Bank of England to raise interest rates from their record low any time soon. Official figures on inflation due at 9.30am are forecast to show no change in the consumer prices index measure. Against the backdrop of tumbling global commodity prices, from food to oil, inflation in the UK has been at or close to zero since February, well below the Bank’s target of 2%. While some have described low inflation as a sign of economic fragility, it relieves the pressure on household budgets after several years of wages falling in real terms following the financial crisis. The latest official figures on the jobs market on Wednesday are expected to put pay growth at 3.1%. MPs could give Gertjan Vlieghe, Britain’s newest interest rate setter, a rough ride when he appears before them in an hour’s time. Vlieghe should expect some tough questions about his previous role as economist at a hedge fund (Brevan Howard Asset Management). Vlieghe was appointed to the Bank of England in late July. He had originally hoped to remain a member of Brevan Howard’s long-term incentive plan, but was forced to exit it to avoid “any mistaken impression” of a conflict of interest. Alan Clarke, an economist at Scotiabank in London, reckons that those concerns may dominate today’s hearing — as Brevan Howard Asset Management (like any hedge fund) could potentially make or lose money due to decisions taken at the BoE. Bloomberg economist Maxime Sbaihi predicts that today’s ZEW survey, due at 10am BST, will show economic confidence deteriorated in Germany this month. Combination of #refugeecrisis, #VolkswagenScandal & EM slowdown is likely to weigh on the German ZEW survey for October (released today). European stock markets are all falling this morning, as the 20% slide in Chinese imports last month spooks traders. 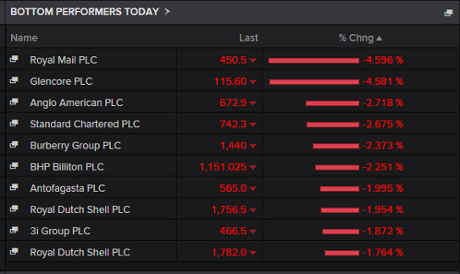 In London, the FTSE 100 has lost 36 points, or 0.6%, led by mining stocks such as Glencore (-4.5%). The French CAC shed 1%, while Germany’s DAX is down 0.6%. A whopping 20% fall in Chinese imports in September didn’t get the day off to the best start, with that drop in demand sure to cause ripples of worry the world over. Shares in SABMiller have jumped by 9% at the start of trading in London, to around £39.50. That’s short of the £44 per share proposal which its board have accepted; the City may not be 100% convinced that AB InBev will pull this deal off. AB InBev now has until 5pm on the 28th October to file a firm offer for SAB, having won the board round with its latest proposal. The key is whether Colombia’s Santo Domingo family, which owns 14% of SABMiller, feels £44 per share is enough. You know a deal is big when it moves the pound. Here’s how sterling reacted to the news that AB INBev and SABMiller have agreed terms. One of the biggest takeover battles in the City in recent years is heading to a climax this morning. 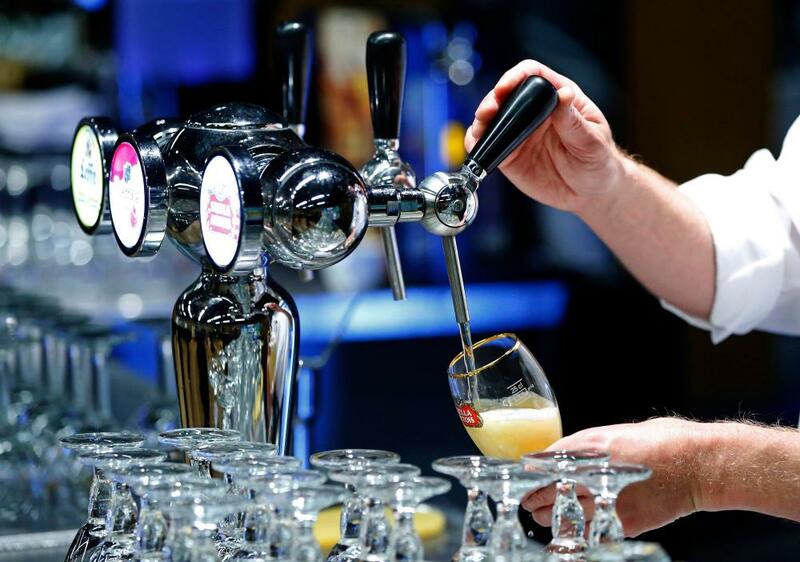 Anheuser-Busch InBev, the brewing giant behind Stella Artois and Budweiser, has announced it has “reached an agreement in principle on the key terms of a possible recommended offer” for its rival, SABMiller (producer of Grolsch, Peroni, Pilsner Urquell…). Here’s the statement issued to the City. At £44 per share, the deal values SABMiller at around £68bn — making it the biggest takeover of a UK company ever. It’s not signed and sealed yet, though – it still needs the support of SAB’s shareholders. Yesterday, SAB rejected £43.50 per share, but the board has now calculated that it can’t turn down this new higher offer. They have a deal. #SABMiller agrees “in principle” to £44 per share offer from #ABInBev. Now they face the regulators. The impact of China’s slowdown will be felt around the globe, warns economist Cees Bruggemans. The 20% tumble in Chinese imports last month means that growth is continuing to slow, says Yang Zhao, China economist at Nomura Holdings Inc. in Hong Kong. GDP growth was measured at 7.0% in the second quarter of 2015. The latest trade data from China has sent a shiver through the markets this morning. Chinese imports slumped by over 20% year-on-year in September (in dollar terms), a worse performance than economists had expected. That means imports have now fallen for 11 months running, as the country’s economy has slowed. Exports dipped by 3.7% — better than the 6% slide which was expected. But it’s the slump in imports that is alarming analysts, as it hints at more problems building in China. Imports plunged 20.4% in September from a year earlier to $145.2bn, customs officials said, due to weak commodity prices and soft domestic demand. These factors will complicate Beijing’s efforts to stave off deflation, one of the headwinds threatening the world’s second biggest economy. The news helped to drive shares down in Asia, where Japan’s Nikkei fell over 1% overnight. Commodity prices also weakened, as investors calculated that China would be importing less raw materials in the months ahead. Introduction: Has UK inflation turned negative again? After the glamour and drama of yesterday’s Nobel economics prize, we’re back into the gritty world of data this morning. At 9.30am, the latest UK inflation figures for September could show that the cost of living is falling again (at least according to the Consumer Price Index). It was 0% in August, mainly due to cheaper energy costs, and some economists think it could have fallen below zero last month. Then at 10am, Germany’s ZEW economic sentiment index will highlight if the emerging market slowdown and the Volkswagen emissions scandal is hurting Europe’s largest economy. 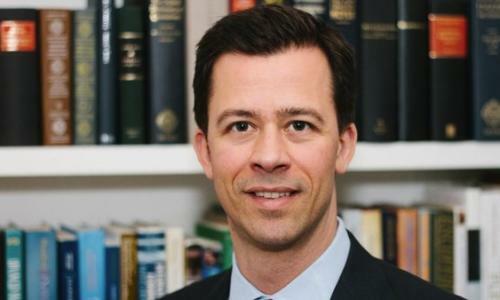 At 10am, MPs on the Treasury Select Committee will grill Gertjan Vlieghe, the newest member of the Bank of England’s monetary policy committee. And the banking reporting season will kick off later, with results from JPMorgan Chase, Citigroup and Wells Fargo. Seven years ago this week, Gordon Brown – the then prime minister – was in full combat mode. Royal Bank of Scotland (RBS) and HBOS were on the brink of collapse and risked bringing down the rest of the financial system with them. Brown was left with little option but to step in with billions of pounds of taxpayers’ money to act as a “rock of stability” to prevent the financial sector collapsing. The intervening years have led to soul-searching through inquiries and changes in the rules about the amount – and type – of capital banks must hold to protect against collapse. Rules about the way bonuses are paid to top bankers have changed: deferral and payment in shares are now the norm for the most senior bankers. Changes are also being made to the way banks are structured following the recommendations by the Independent Commission on Banking, chaired by Sir John Vickers. The government still owns 73% of RBS, down from 79%, and is yet to get rid of all its shares in Lloyds Banking Group, formed when HBOS was rescued by Lloyds TSB during the crisis. This is not a normal state for the UK banking industry. Yet senior bankers are moaning about the difficulties their businesses face because of regulation. John McFarlane, the chair of Barclays, is again talking about national champions in investment banking. He raised it in July and again this week by suggesting that a merger of European investment banks (£) might allow a regional champion to be created to compete with US rivals. Such remarks may help explain why, just a few weeks ago, Paul Fisher, a senior Bank of England official, issued a warning against watering down the post-crisis rules. “We probably won’t know for sure just how effective the new regime is until we reach another crisis. Meanwhile, we need to guard against the reforms being rolled back as a result of a period without crisis,” Fisher told an audience in London. A rise in car exports helped improve Britain’s trade deficit in August, according to official figures. The monthly shortfall in the trade balance for goods narrowed to £3.3bn from £4.4bn in July. However, the UK was still heading for a huge deficit in the third quarter of the year after an upward revision to July’s shortfall. He said this suggests that net trade is probably making “a significant negative contribution to GDP” at the moment. Hollingsworth warned that the strong pound and weakness in demand overseas as the US economy stuttered and the eurozone remained in the doldrums meant the government’s hopes of a significant rebalancing towards manufacturing exports would be dashed in the near term. Alongside the £500m rise in car exports in August, the chemicals industry sent more of its production to the US, the ONS said. Total goods exports increased by 3.5% to £23.6bn in August 2015 from £22.8bn in July 2015. But this positive news was offset by the continued decline in Britain’s oil industry, which has been a major factor holding back progress this year. Lower production and the lower oil price have dented exports, and though oil imports are likewise cheaper, they continue to rise in volume. The mothballing and subsequent closure of the Redcar steel plant could also have had an impact as the export of basic materials dived in August by more than 10%. The services sector recorded an improvement in its trade balance, but the ONS pointed out that the UK continued to rely heavily on the financial services industry to pay its way in the world. Figures for the second quarter showed that the surplus on trade in services was £22.8bn, of which almost half – £10.1bn – was contributed by banks, insurers and the fund management industry. David Kern, chief economist at the British Chambers of Commerce, said the narrowing of the deficit in August was welcome, but taking the July and August figures together pointed towards a deterioration. “This confirms our earlier assessment that the significant improvement seen in the second quarter was only temporary. Kern urged the government to adopt measures that will “secure a long-term improvement in our trading position”. Zoe Williams (It’s fine to print money, so long as it’s not for the people, 5 October) raises an important question about quantitative easing (QE). In the wake of the global financial crisis, it was adopted by the Bank of England. Capital markets had ceased to function. The banking system was in deep crisis. In the US and Britain, governments were driven to inject equity into the collapsing banking system. These huge outlays had to be funded by the issuance of public debt. The Bank made clear to the prime brokers (mainly the major commercial banks) that they would be offered access to zero-cost funds in order to bid in Treasury auctions. These funds were provided electronically by the Bank into the accounts of those banks held with it. These no-cost credits enabled the prime brokers to purchase the government debt, and by agreement swap back the debt to the Bank at a modest profit. Once this happened, the electronic advances made by the Bank were cancelled. The net effect was threefold. First, the government’s solvency was preserved. Second, the prime brokers were able to secure profit from guaranteed transactions to replace more traditional forms of lending. Third – the odd bit – the Bank ultimately ended up holding the debt of the British government, not the private sector of the economy. This reveals the “efficient secret” of central banking. The Bank is effectively financing the state through the indirect purchase of government debt. Zoe Williams asks the question: why can’t this “mechanism” be used to finance other major projects? The answer is that it could. QE involves little or no monetary expansion. It has no inflationary consequences. But these matters are not widely understood. Time for a reasoned debate on the merits of its wider use in these most unusual times. • Zoe Williams says “all money is created from nowhere”. She is talking through her hat. The basis of money, which is gold or, in some cases, other commodities (mainly metals) is as founded in the real world as any other product. To find, mine, refine and distribute gold requires vast amounts of human labour, which is why it is valuable – all value coming from the labour embedded in something. Paper money and credit is simply a claim on real money, a paper or electronic token which saves carrying around bags of gold and it runs back to real money eventually. Issuing more tokens than there is gold is a large part of credit and banking, relying on everyone not turning up at the same time to claim it. It has a place and helps the world economy spin round, but detach it too far from real value (print too much) and it starts to create problems – like raging inflation, bank defaults etc. When Richard Nixon took the dollar off the gold standard, the US was effectively bankrupt, surviving only by devaluing its debts and reneging on the agreed price for its imports. It has continued doing so ever since. Someone pays the price, and that is the developing world mainly. And eventually it collapses anyway, like it did in 2008. The capitalist world has lately got away with throwing vast amounts of QE into the system only because the results have not yet come home to roost; but once more other people are paying, such as the Greek workers, the Middle East and, above all, China soaking up the paper money. It cannot go on much longer. Even the Guardian routinely points out the imminence of further crisis. So, no, more of the same, however it is directed, solves nothing. • How refreshing to read some common sense on macroeconomic policy. As long ago as 1948, Dudley Dillard (The Economics of John Maynard Keynes) was saying similar things: “Is there any necessity for subsidising the commercial banks by paying them huge amounts of interest to create the new money which is required for economic expansion? Is not the creation of new money properly a government function?” He clearly advocates “people’s QE”, though it is not called that. To the extent that there are underemployed resources and supply is responsive, it should not be inflationary. • Zoe Williams’ article about printing money which does not grow on trees reminds me of an incident that took place in my university days. On a family visit to Cambridge, I had seen some rather expensive books which would help my studies. Over a cup of tea, I asked my father (a fruit grower, who specialised in apples) if he would kindly buy them for me. He replied that he had no money. “You must have,” I said. “You have just sold a whole cold store of apples.” He indignantly exclaimed: “Apples don’t grow on trees, you know.” I got my books. America’s trade gap has hit a five-month high, in another sign that global economic growth may be weakening. US imports rose by 1.2% in August, fuelled by a 3% increased in purchases from China. But exports shrank by 2%, to their lowest point since October 2012. That indicates weakness in key markets such as emerging nations and Europe. It could also reflect the impact of the stronger US dollar, which has gained against other currencies. This drove the US Trade Deficit up to $48.33bn in August, up from $41.81bn a year ago. The VW scandal hasn’t hurt the UK auto industry yet – car sales hit an all-time high in September, according to new data today. Petrol-powered cars saw the strongest demand; suggesting some consumers might be more wary about diesel now. Workers at Volkswagen have been warned to expect painful changes as the German carmaker tackles the emissions scandal. New CEO Matthias Müller told staff that non-essential investments will be delayed or abandoned as it wrestles with the crisis. “Technical solutions to the problems are within view. However, the business and financial consequences are not yet clear”. “Therefore we are putting all planned investments under review. What is not urgently needed will be scrapped or delayed”. Muller’s warning came after works council boss Bernd Osterloh predicted that bonus payments to workers are now at risk too. Our Katie Allen confirms that Britain’s directors do not march on an empty stomach, or an environmentally friendly one…. Update: IoD delegates have now plonked themselves outside in the sun — making a nice photo for visiting tourists. Delegates at the Institute of Directors’ conference are tucking into their legendary lunchboxes — a chance to refuel after a morning discussing weighty topics like Europe and migration. Perhaps Britain’s new tax on plastic bags should be extended? £10 per plastic lid might cover it…. Brewing firm SABMiller has turned down an ‘informal offer’ from rival Anheuser-Busch InBev, according to a Bloomberg newsflash. That’s sent SAB’s shares down 3%, to the bottom of the FTSE 100 (budge up, Glencore!). This come three weeks after AB INBev, which brews Stella Artois and Budweiser, approached SAB, whose brands including Grolsch and Peroni. Any deal would be huge, creating a new company worth perhaps $250bn (£160bn). AB InBev has just a week to make a firm bid or walk away, so it’s not Last Orders in this story, yet. 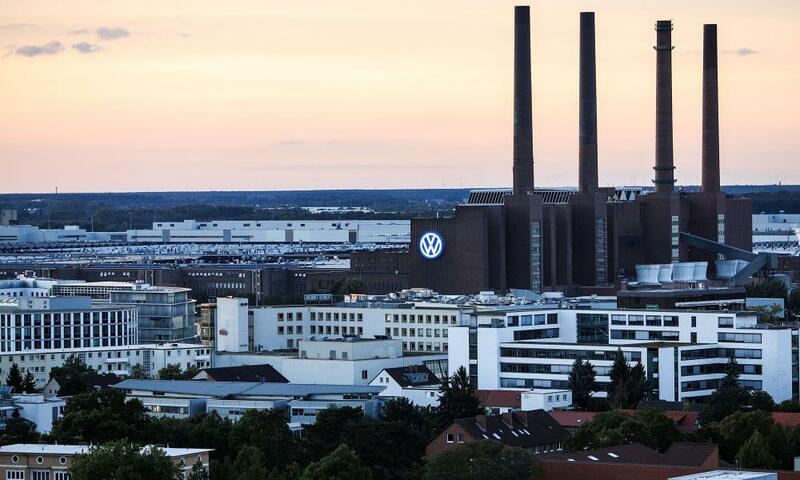 The works council boss at Volkswagen, Bernd Osterloh, has told staff that the company will have to review all its investments following the emissions crisis. He also predicted that their pay packets will suffer too. 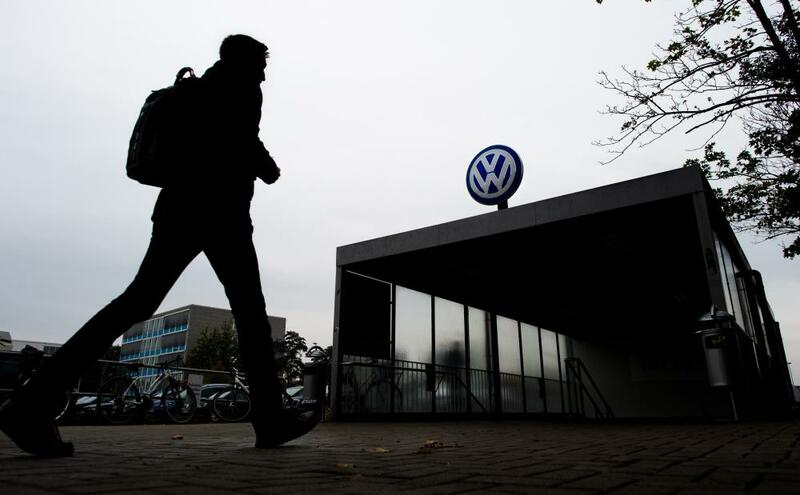 All investments at Volkswagen will be placed under review, the carmaker’s top labour representative said on Tuesday, as the embattled German group grapples with the fallout of its diesel emissions scandal. “We will need to call into question with great resolve everything that is not economical,” Bernd Osterloh, head of VW’s works council told more than 20,000 workers at a staff gathering in Wolfsburg, Germany. Volkswagen has revealed that it sold eight million cars with defective emissions testing software across Europe. It made the admission in a letter to German MPs, dated last Friday. That’s the bulk of the 11 million cars affected, including almost 500,000 in the US. We already know that 1.2m cars sold in the UK contained software to beat emission tests, plus 2.8m in Germany. Back at the IoD conference, Nigel Lawson and Peter Mandelson are having a brisk exchange of views over Britain’s membership of the EU (Lord M is pro, Lord L is con). 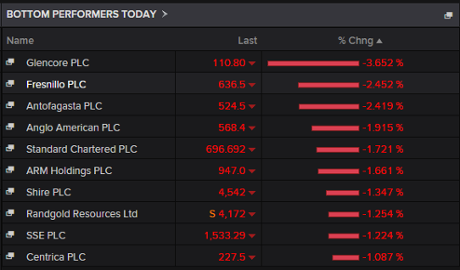 Mining shares are leading the fallers in London this morning. The 1.8% drop in German factory orders in August isn’t helping the mood. Investors are concerned that falling demand from emerging markets could increase the raw materials glut, which has already driven commodity price down to multi-year lows. Over at London’s Royal Albert Hall, business leaders are gathering for the annual Institute of Directors convention. The 2,000 or so delegates will be hearing first from IoD head Simon Walker. As we reported this morning, Walker will use his speech to warn prime minister David Cameron that waiting till 2017 to hold the referendum on EU membership risks turning it into a confidence vote in the government. He wants the referendum brought forward to 2016. Next up, just after 10am is a debate on Britain’s EU membership between former Labour business secretary Lord Mandelson and former chancellor Lord Lawson, who last week announced he will lead a Conservative party campaign to leave the EU. Alongside its trailing of Walker’s EU referendum thoughts, the IoD is also using its convention to adds its thoughts to the never-ending UK productivity puzzle debate. Policymakers are looking at the puzzle all wrong, according to the business group’s new report, Balancing UK Productivity and Agility. It wants more focus on “agility” to ensure “new ideas and technologies spread throughout the economy as quickly as possible”. It warns factors that have driven productivity gains in the past, such as large firms realising economies of scale and developing deep specialisations in certain areas, are no longer relevant for the UK and “it would be foolish to try to recreate them”. “In pursuing the nirvana of steadily-rising productivity, one has to bear in mind how our economy is changing, how people choose to work, and what future economic success will look like. His report echoes scepticism over how much can be gleaned from current productivity data and what many economists see as a narrow focus on mere output per hour measures. Back in the UK, house prices dipped by 0.9% last month, according to mortgage lender Halifax. But that’s little relief to those hoping to get a house (or buy a bigger one. Prices are up around 8.9% year-on-year. On a quarter-on-quarter basis, they’ve been gaining since the start of 2013. Interesting…. 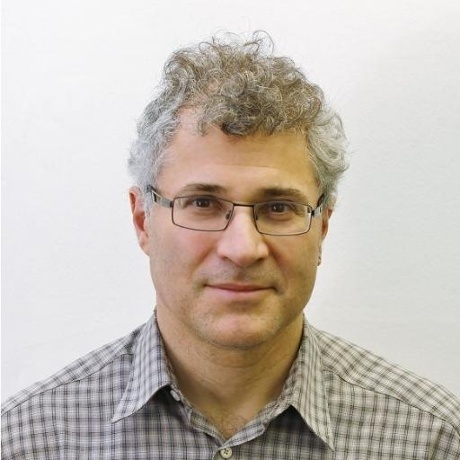 Jonathan Portes, one of the UK’s better known economists, has left his post as director of the National Institute of Economic and Social Research thinktank. There doesn’t appear to be an official announcement, but NIESR has updated its website to show that Dame Frances Cairncross is now ‘interim director’. Portes (who’s staying at NIESR as a research fellow until April) is known for using his statistical nous to fact-checking erroneous claims in the papers, especially over the impact of fiscal policy on poorer households. 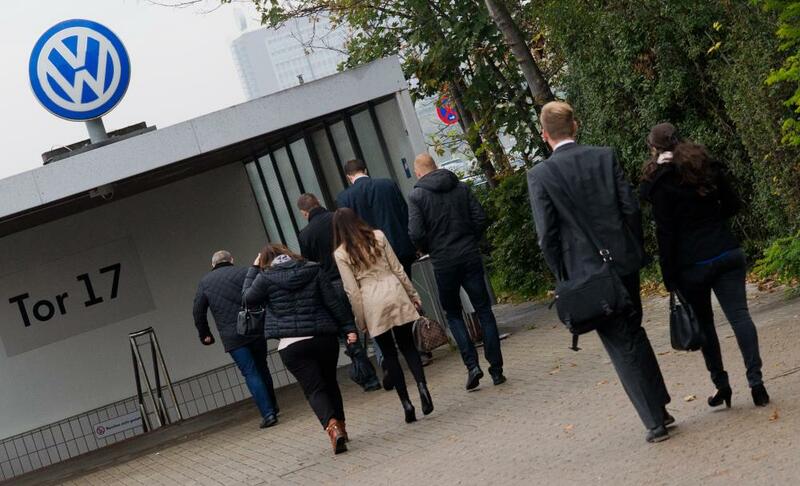 Over in Wolfsburg, thousands of Volkswagen employees are meeting at company HQ to hear from their new CEO. Matthias Müller will brief staff on the ongoing emissions scandal, as Volkswagen strives to find a solution after selling millions of vehicles containing ‘defeat devices’ to fool emissions tests. Müller was appointed as CEO less than two weeks ago, after Martin Winterkorn stepped down following the revelations that VW engines contained illicit software to hide how much noxious gases they produced. 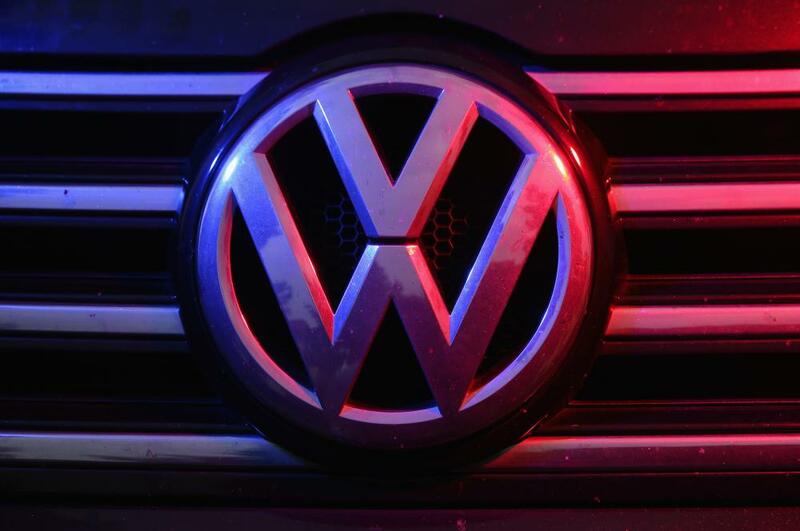 It emerged last night that the probe into the VW scandal centres on two top engineers. Ulrich Hackenberg, Audi’s chief engineer, and Wolfgang Hatz, developer of Porsche’s Formula One and Le Mans racing engines, were among the engineers suspended last week, according to the WSJ. European stock markets are being dragged down by the news that German factory orders slid in August. The main indices are all in the red in early trading, with Germany’s DAX shedding almost 0.5%. Investors may also be anxious about the eurozone, after Brussels warned Spain last night that i’s 2016 budget isn’t good enough, and needs more spending cuts. A huge miss in German factory orders (complete with a downward revision for last month’s figure) seems to have taken the edge off of the Eurozone, following a Eurogroup meeting yesterday that hinted at more trouble for the currency union going forwards. European Commissioner Pierre Moscovici warned that Spain will miss its headline targets in 2015 and 2016, providing yet another bearish note from the country that already includes a 21 month low manufacturing figure, a 9 month low services PMI, a separatist victory in Catalonia AND an impending general election in September. German factory orders dropped for the second consecutive month in August, led by a drop in demand from countries outside the eurozone and lower demand at home. The Economy Ministry said Tuesday that orders were down 1.8% in seasonally adjusted terms compared with the previous month. That followed a 2.2% drop in July. Orders from other countries in the euro area were up 2.5%, following a smaller gain in July. 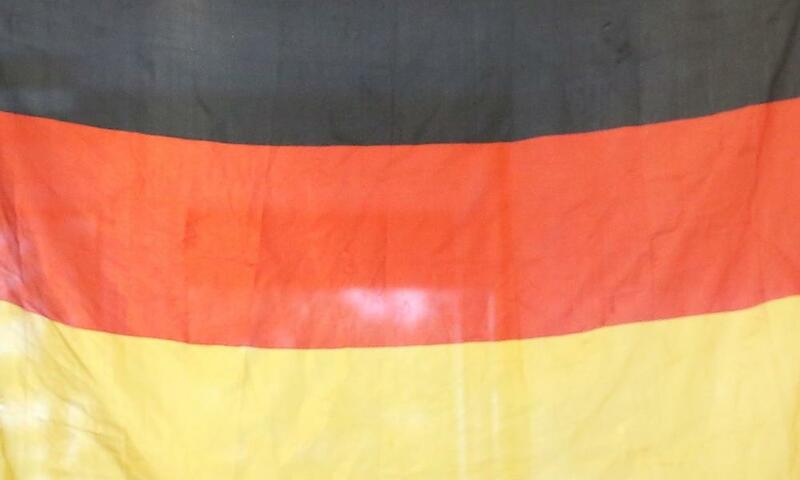 However, demand from inside Germany was off 2.6% percent and orders from outside the eurozone dropped 3.7%. This chart confirms that German industrial orders have tailed off in the last couple of months, after a decent start to the year. The red line shows the total (or Insgesamt), while the blue line shows domestic orders (Inland) and the yellow line shows overseas orders (Ausland). German factory orders fell unexpectedly in August, fuelling fears that Europe’s largest economy is being hit by slowing global growth. 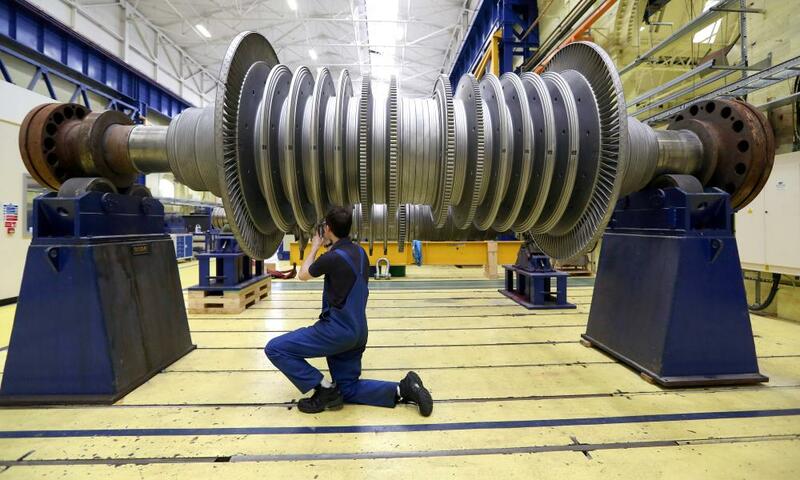 Industrial orders slid by 1.8%, according to the economy ministry, dashing expectations of a 0.5% rise. The decline was mainly due to falling demand from outside the eurozone, according to the ministry (which also attribute some of the decline to holidays). Orders from non-euro countries slid by 3.7%, while domestic orders shrank by 2.6%. This is before the Volkswagen emissions scandal struck, hurting confidence in German industry. July’s industrial orders has been revised down too, from -1.4% to -2.2%; again, driven by a decline in overseas demand. It’s a worrying sign, suggesting ripples from the emerging market slowdown are now lapping against the eurozone. There’s a relaxed mood in the markets this morning, as investors become increasingly convinced that central banks won’t be able to tighten monetary policy anytime soon. European stock markets are expected to inch higher after the Dow Jones industrial average jumped by 304 points overnight. Last Friday’s disappointing US jobs report has probably helped to kick the first American interest rate rise into 2016. The weaker than expected US jobs report significantly reduces the chance of a rate hike this year from the Federal Reserve. Europe and China could also be on the verge of adding stimulus with deflation and low growth possibly enough motivation for the respective central banks to intervene before the end of 2015. Over in Japan, the Nikkei has closed 1% higher, as traders in Tokyo anticipate more stimulus from their own central bank. The bosses of Britain’s top companies will be gathering at the Institute of Director’s annual bash in London. They’ll be discussing Europe and the refugee crisis (among other topics). Six former City brokers are going on trial over allegation that they rigged the benchmark Libor interest rate. And in the City, we’ll be looking at results from budget airline easyJet and pastry purveyor Greggs…..
With inconclusive economic data in recent weeks, the Fed is now split on the timing of an interest rate rise. That situation is unlikely to change in response to today’s non-manufacturing figures, which aren’t strong enough to sway Janet Yellen and Co towards a clear decision. A decline on last month puts a dampener on what is actually quite a robust set of numbers. It’s not all doom and gloom, however, as Yellen’s reluctance to act may be seen as a positive move elsewhere. Wall Street, which has been quiet as it awaits consistency among the financial uncertainty, may now be prompted into increased activity before the end of 2016. 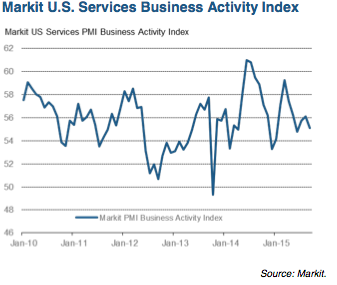 Confirmation that the US services sector saw slowing growth in September comes from the Institute for Supply Management. The ISM services index fell to 56.9 from 59 in August, and lower than analysts’ expectations of a reading of 57.5p. Both new orders and business activity slowed. America’s service sector is growing by less than expected, according to the first of two rival surveys. 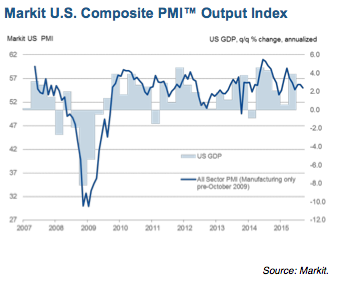 Markit’s final purchasing managers index for the sector came in at 55.1 for September, down from an early reading of 55.6, which was also what analysts had been expecting for the final figure. That compares to 56.1 in August. The US economic growth slowed in the third quarter according the PMI surveys, down to around 2.2%. But this largely represents a payback after growth rebounded in the second quarter, suggesting that the economy is settling down to a moderate rate of growth in line with its long term average. Hiring also remains relatively robust, albeit down from earlier in the year, again suggesting that the economy has shifted down a gear but remains in good health. “At the moment it remains unclear as to whether growth will weaken further as wemove into the fourth quarter. However, with inflationary pressures waning, policymakers may have some breathing space to gauge the extent of any slowdown. Lower fuel costs helped push average prices charged for goods and services dropping at steepest rate for nearly five years. In tandem with other global markets, Wall Street is moving ahead strongly. The Dow Jones Industrial Average is up 164 points or 12%, while the S&P 500 has opened 0.5% higher. Markets are being driven by hopes that central banks will not pull the plug on financial support in the immediate future. Friday’s poor US jobs numbers have convinced investors that the prospect of a Federal Reserve rate rise this year is looking less and less likely. Another factor supporting the market is a rising oil price, which is boosting energy shares. Brent crude is up 2% after reports that Russia wants to meet other producers to discuss the market, where oversupply and falling demand have sent oil prices sharply lower. That could, believe some, presage production cuts. Meanwhile Friday also saw a fall in the number of rigs drilling for oil in the US. China can manage its economic slowdown but needs to communicate policy more effectively, says the International Monetary Fund. Ahead of its annual meeting the IMF said China’s exchange rate was in line with medium term fundamentals after the recent devaluations, Reuters reports. An unprecedented international collaboration on tax reform, led by the G20 nations and targeting many of the world’s largest global corporations, will wipe out much of the tax avoidance industry, it was claimed today. The two-year reform programme, under the auspices of the OECD, was prompted by a spate of revelations in recent years about the tax affairs of multinationals including Starbucks, Google and Amazon. Alongside the final batch of reforms, published today, the OECD released what it called “extremely conservative” estimates suggesting large global businesses were shifting profits and eroding the tax receipts of economies around the world at a cost of $100bn (£65bn) to $240bn a year — equivalent to between 4% and 10% of global corporation tax revenues. In the face of increasingly aggressive tax avoidance, countries have been forced to rely more heavily on taxing income less able to be shifted abroad — such as workers’ pay and VAT. Britain’s recovery slowed last month, according to the latest survey of its dominant service sector. Companies reported that activity grew at the slowest pace in two and a half years. Economists blame fears over China’s economy, and predict that GDP could grow by just 0.4% in the last three month of this year. 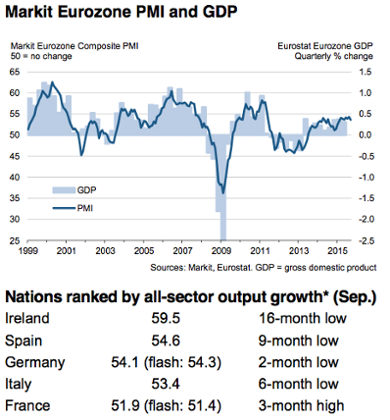 Expansion across the eurozone also eased back in September, data firm Markit reports. Firms in Germany, Spain and Ireland all said growth was slower, although France’s bucked the trend. 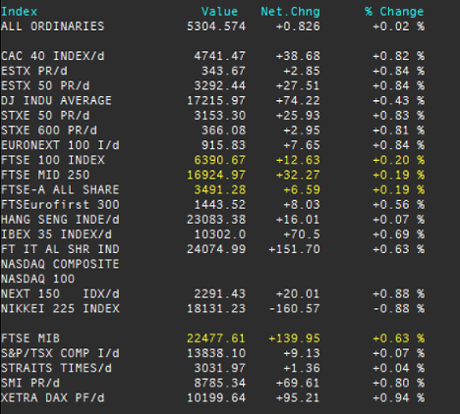 European stock markets are up. Shares are being driven by hopes that central banks will continue to stimulate the global economy, and resist early interest rate rises. 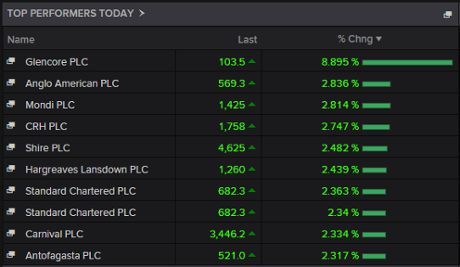 The FTSE 100 is now at its highest point of the day, up 132 points at 6262. 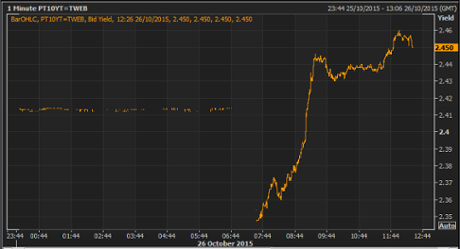 The French CAC has soared by over 3%. Two dozen Pacific-Rim countries are celebrating the creation of a major new trade partnership. 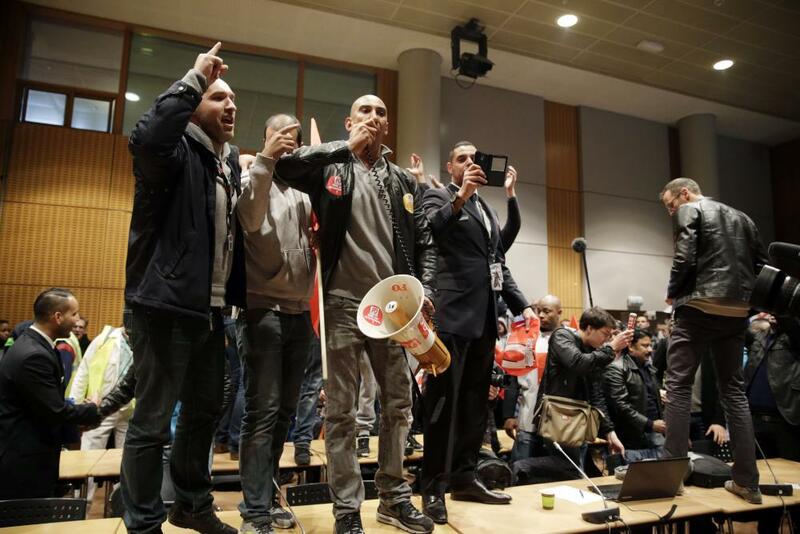 Workers have stormed the boardroom of Air France today, as the airline announced plans to cut 2,900 jobs. Two senior executives were forced to flee with ripped shirts. The Greek government is preparing its new budget. 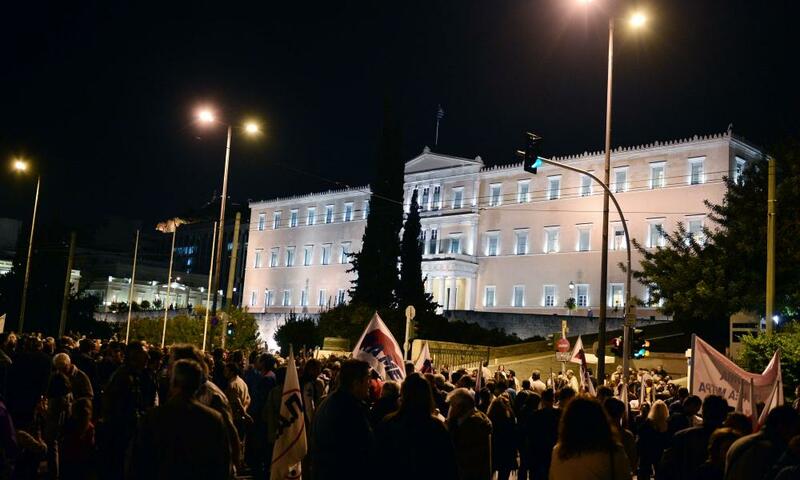 Alexis Tsipras’s government must explain how it will implement tough tax rises and spending cuts demanded by lenders. Finance minister Euclid Tsakalotos is meeting fellow eurozone finance ministers in Brussels today. They’ll discuss the various prior actions Greece must deliver to receive its next aid tranche, and to open talks on debt relief. And in the UK, chancellor George Osborne has confirmed that he’s selling off shares in Lloyds Banking Group to the public at a chunky discount. The Trans-Pacific Partnership deal is “a huge strategic and political win for US President Barack Obama and Japan’s Shinzo Abe,” says the FT’s Shawn Donnan. It represents the economic backbone of the Obama administration’s strategic “pivot” to Asia and a response to the rise of the US’s chief rival, China, and its growing regional and global influence. It is also a key component of the “third arrow” of economic reforms that Mr Abe has been pursuing in Japan since taking office in 2012. Over in Atlanta, a dozen Pacific Rim nations have reached the most sweeping trade liberalization pact in a generation. After late hitches over drugs monopolies, and New Zealand’s dairy market, the Trans-Pacific Partnership (TPP) has been hammered out. It is meant to lower trader barriers in the region, and set common standards in around 40% of the world economy. The TPP aims to lower trade tariffs between the signatory nations and bring in wide-ranging new regulations for investment, agriculture, intellectual property, labour and the environment. This in turn could mean cheaper food, medicine and everyday household goods for millions of people. It will also help the 12 countries to counter China’s rising economic influence in the region. The Brussels press pack are assembling for today’s meeting of finance ministers, where Greece’s new bailout package will be discussed. 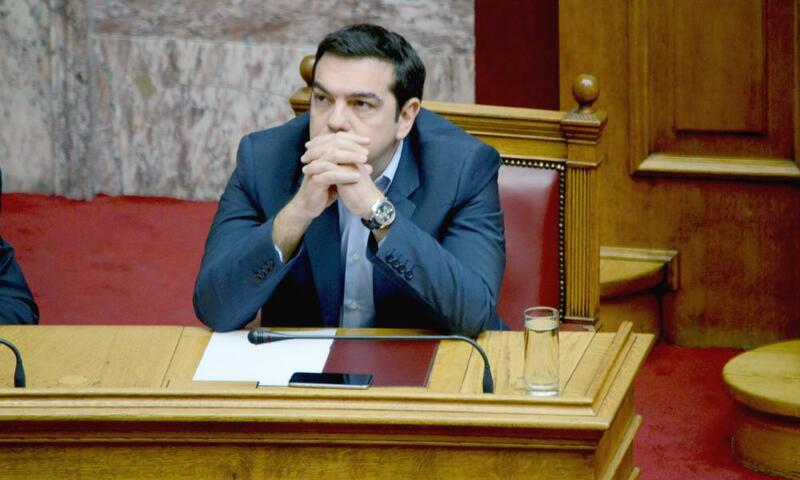 Prime Minister of Greece Alexis Tsipras in parliament last night. Photograph: George Panagakis/Pacific Pres/BI/. The Greek parliament is back in full force today with prime minister Alexis Tsipras outlining his newly elected government’s policy programme as the draft 2015 budget is also submitted. After a week of diplomacy abroad, the Greek prime minister must now face the music of applying what will be the most onerous financial rescue programme to date. It will not be easy. From months of often fraught negotiations just getting to the point of reaching agreement over the bailout deal, the debate has shifted from the abstract to the real with Greeks now being bombarded with news of what the latest accord will entail. 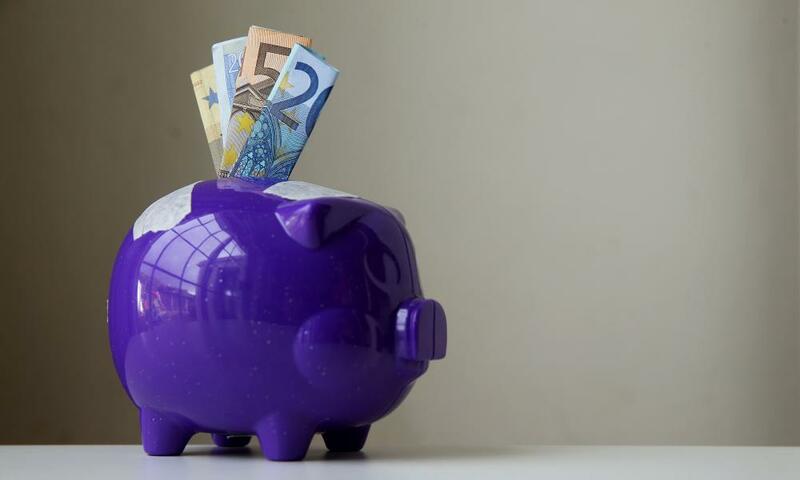 The draft budget is expected to outline an array of hard hitting levies, including the much-hated property tax known as Enfia, as well as pension cuts and structural reforms – the price of being bailed out for a third time to the tune of €86bn. The measures will throw the debt-stricken economy into recession with the budget forecasting a return to growth in 2017 (for many a conservative estimate). The Greek finance minister, Euclid Tsakalotos, who is on his way to Luxembourg, will outline the savings and government priorities when he meets euro area counterparts attending tonight’s Euro Group. The measures, which are expected to include deep cuts to monthly pensions over €1,000, have to be implemented in the coming weeks – before more than 60 others are enforced in November for international creditors to begin a review of the Greek economy. All of which is going to require nifty explanation when Tsipras (whose radical left Syriza party was first catapulted into office vowing to “cancel” such measures) takes to the podium to present the policies of his second term in office at 7:30pm this evening. Unions and leftists are already girding for battle. “We are organising the response of popular workers to the new wave of attack,” the communist Pame announced this morning, calling on Greeks to participate in a mass rally on October 22 and a strike on November 12. 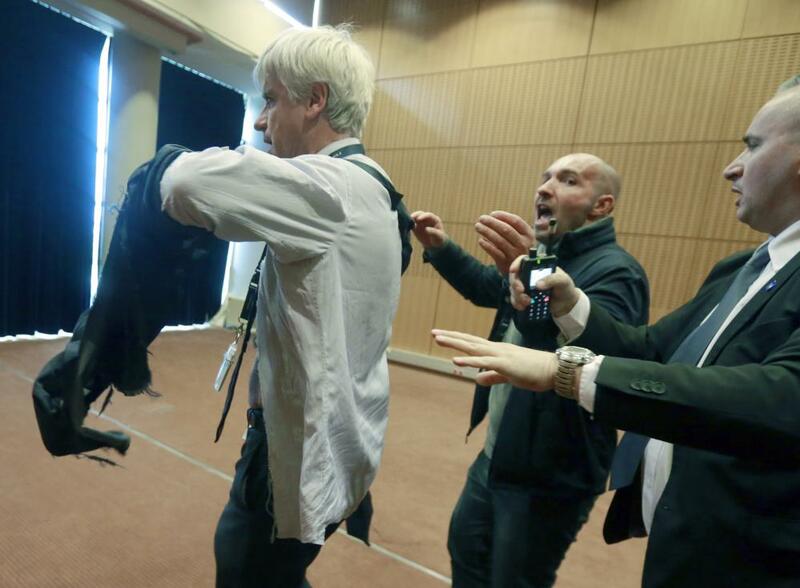 Air France-KLM has criticised those responsible for today’s violence, and insisted that most staff were protesting peacefully before a group burst into its boardroom. Fortunately, Xavier Broseta and Pierre Plissonnier did manage to escape the demonstrators, sans chemises. Over in Paris, two Air France executives appear to have had their shirts ripped from their backs after the airline announced plans to cut up to 2,900 jobs. According to local media reports, several hundred workers stormed the airline’s headquarters this morning, after it announced the cutbacks. Photos from the scene show Pierre Plissonnier, Air France’s assistant director for long-haul flights, leaving the scene in a disheveled state. Human resources boss Xavier Broseta is pictured trying to climb a fence to flee. It’s not clear exactly what happened. But the AFP newswire reports that CEO Frederic Gagey “made a hasty exit, according to two members of the committee”, after workers broke into the meeting. Unions have also called a strike to protest at the job cuts, which were announced after pilots turned down a proposal to work 100 more hours per year for the same salary. It could see 300 pilots, 700 air hostesses and stewards, and 1,900 ground staff laid off by 2017. Le Figaro reports that Air France is planning to file a complaint of “aggravated violence”. More here. European stock markets aren’t panicking at today’s service sector slowdown. Instead, they continue to rally –– catching up with Wall Street’s late jump on Friday night. France’s CAC index is the best performer, following the news that its services firms actually caught up (a little) with the rest of the eurozone last month. But other markets are also gaining ground, with the FTSE 100 jumping over around 2%, despite warnings that the economy may be slowing down. Well, investors do seem confident that the US Federal Reserve won’t raise rates this month, and probably not before 2016. That’s bullish for shares, and also weakens the US dollar — which has a positive effect on commodity prices and oil. And that’s why mining shares are up today, while Royal Dutch Shell has gained 4%. UK and European markets were higher across the board on Monday, playing catch-up from the biggest turnaround on the Dow Jones Industrial Average in four years on Friday. The French CAC was higher by over 2.5% supported by positive French service sector data. Missed expectations for Germany’s service sector took the edge off gains on the DAX, which was still higher by over 1.5%. A new survey of Britain’s top finance chiefs confirms that the UK economy may be weakening. China’s downturn, the prospect of rising interest rates and uncertainty about the global economic outlook have knocked confidence among bosses of the UK’s biggest companies, according to a survey. Chief financial officers (CFOs) polled by the consultancy Deloitte reported a sharp rise in uncertainty facing their businesses and have scaled back their expectations for investment and hiring over the coming year. Almost three-quarters of the 122 CFOs, or 73%, said the level of financial and economic uncertainty was either above normal, high or very high. That was up from 55% in the second quarter of this year and is the highest proportion for more than two years. The slowdown across Britain’s service sector is putting the recovery at risk, says David Noble CEO at the Chartered Institute of Procurement & Supply. He blames the knock-on effect of China, which sparked global market panic in August after Beijing devalued the yuan. The further softening of growth in the services sector must now be causing some concern for the sustainability of the recent recovery in the UK economy…. It appears that when China sneezes, the world catches a cold as some companies cited the region as a cause for worldwide concern. Weaaaaaaak UK services PMI. Slowest growth since April 2013. Slowdown coming? Britain’s service sector suffered a sharp slowdown last month, new data shows, raising fears that the economy may be faltering. Data firm Markit reports that activity across the sector grew at its slowest rate since April 2013 in September. Its service PMI fell to 53.3, from August’s 55.6 (where 50=stagnation). Firms reported that new business slowed, with some clients unwilling to place new contracts in the current “global economic uncertainty”. More encouragingly, firms did keep hiring staff, but business investment is also under pressure. And with Germany, Ireland and Spain’s service sectors also slowing (see last post), signs are building that the European economy may be faltering. Markit’s Chris Williamson fears that “the economy sank further into a soft patch at the end of the third quarter”, and is only growing at 0.3% per quarter. 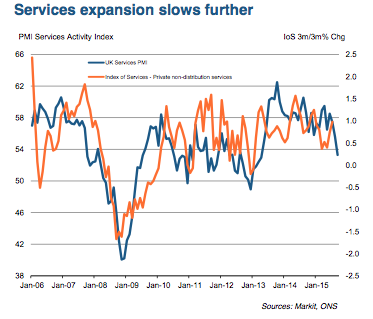 Services makes up around three-quarter of the UK economy, so any slowdown has serious consequences. “Weakness is spreading from the struggling manufacturing sector, hitting transport and other industrial-related services in particular. Growth across Europe’s private sector is slowing, according to the latest healthcheck of the region’s service sector. Markit’s Eurozone PMI, which measures activity at thousands of companies, dipped to a four-month low of 53.6 in September, down from 54.3 in August. That shows the sector kept growing, but at a slower rate. Growth in the service sector hit a seven-month low, with the Services PMI dropping to 53.7 from 54.0. “The final PMI reading came in slightly below the earlier flash estimate but still leaves a signal of the eurozone economy having expanded 0.4% in the third quarter. “However, the failure of the economy to pick up speed over the summer will be a disappointment to the ECB, especially with job creation sliding to an eight-month low. “The weakening of the pace of expansion in September raises the risk of growth fading further in the fourth quarter, which would in turn boost the likelihood of the ECB opening the QE taps further. That shows optimism that central banks will do more to stimulate the global economy, now that the US labor market appears to be weakening. Consensus is building that the Federal Reserve won’t now be in a position to hike interest rates before the end of the year. This gives emerging markets a little more breathing room and it’s the mining stocks that are forging their way to the top of the table. Shares are rallying across Europe this morning, fuelled by hopes that central banks keep topping up the punchbowl for longer. 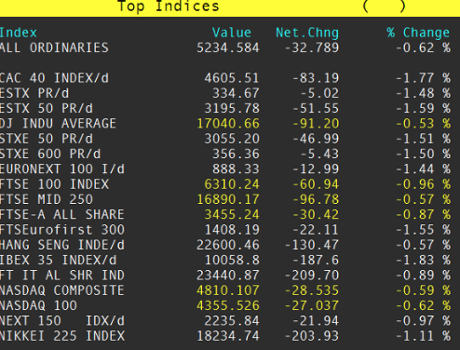 France’s CAC index is the biggest riser, up nearly 2%, and Germany’s DAX gaining 1.3%. The FTSE 100 is close behind, up almost 100 points, as traders shake off their disappointment over Saturday night’s rugby. Investors have had a weekend to ponder Friday’s disappointing US jobs report, and concluded that a weak labor market means the Federal Reserve will resist raising interest rates in 2015. And that’s encouraging them back into the market. Glencore’s shares have rallied by 8% in early trading in London, fuelled by that takeover talk and speculation that it could sell its agricultural business. 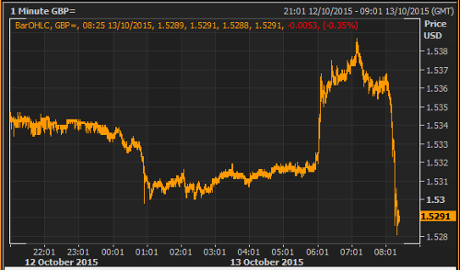 They’re up 7.8p at 108.6p, having briefly jumped 20% to 114.45p. That’s quite a recovery, given they slumped to 66p last week. However, it’s a weaker rally than in Asia, though, where they spiked 70% at one stage today. That could dampen some of the chatter that a big deal is close….. 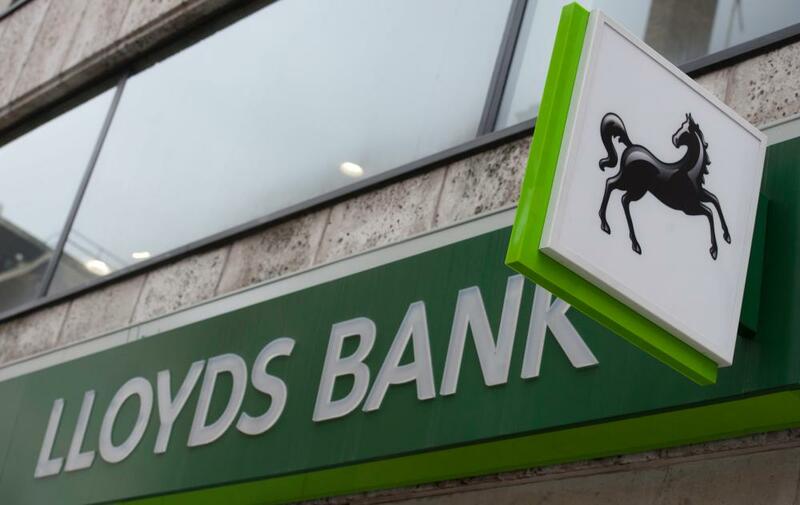 The Treasury has announced plans to sell £2bn of Lloyds shares in a retail offering. Anyone taking part will get a 5% discount, plus a bonus shares for every 10 they hold for at least a year. The value of the bonus share incentive will be capped at £200 per investor. People applying for investments of less than £1,000 will be prioritised. The move brings a bit of Thatcherite glamour (?!) to the Conservative Party conference, where delegates fondly remember the “Tell Sid” privatisation fetish drive of the 1980s. But as the Economist’s Stan Pignal points out, discounted share sales benefit some rather more than others…. The sale of Lloyds shares to small investors at a discount is a subsidy from taxpayers to middle-class people with brokerage accounts. 10 minutes until the FTSE100 opens – expected to start +110 points at 6240. Reports that Glencore is in talks to sell its entire agriculture business are helping to drive its shares higher. That would provide fresh resources to tackle its $30bn debt mountain, and to handle a further drop in commodity prices. Something is going on at Glencore, the troubled commodity trading and mining company. Shares in Glencore leapt by over 70% in Hong Kong overnight, and are currently up over 30%. This comes after the Daily Telegraph reported that Ivan Glencore is prepared to listen to takeover offers for the company he has created, following the recent slump in its value. Glencore would listen to offers for a takeover of the entire company but its management does not believe there are any buyers willing to pay a fair value for the business in the current market. That report appears to have sparked a wave of buying into Glencore, whose shares have lost around three-quarters of their value in the last year. Glencore itself, though, says it’s “unaware” of the reason behind the surge, according to Bloomberg’s Jonathan Ferro. Big news breaking in the retail sector — American Apparel, supplier of ethical clothing and god-awful adverts, has filed for bankruptcy protection. The move follows a steady slide in sales, and ever-more disturbing antics by ex-chairman Dov Charney, who was forced out a year ago. A new week begins with investors digesting still last Friday’s disappointing US jobs data. September’s Non-Farm Payroll was a bit of a shocker, with just 142,000 new jobs created, and wages unchanged month-on-month. That suggests America’s economy is being hit by the slowdown in emerging markets such as China, raising fears that a new downturn is looming. And that has actually pushed shares higher in Asia this morning on speculation that monetary policy is going to stay loose for even longer. We’ll get a fresh insight into the health of the global economy today, when new surveys of the world service sector are released. Those Purchasing Managers Surveys will show if growth speeded up or slowed down; we get the eurozone report at 9am BST and the UK at 9.30am BST. And over in Greece, Alexis Tsipras’s new government will be presenting its new budget, ahead of a vote on Wednesday.